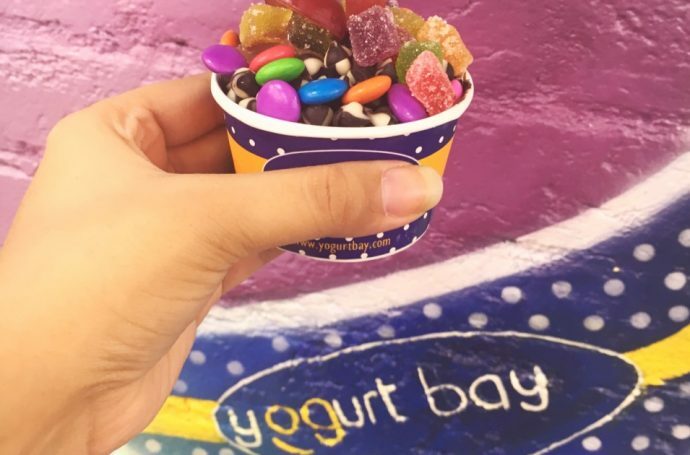 Yogurtbay Lower Parel is a place where you can not only fulfil your Yogurt craving, but also your waffle cravings. 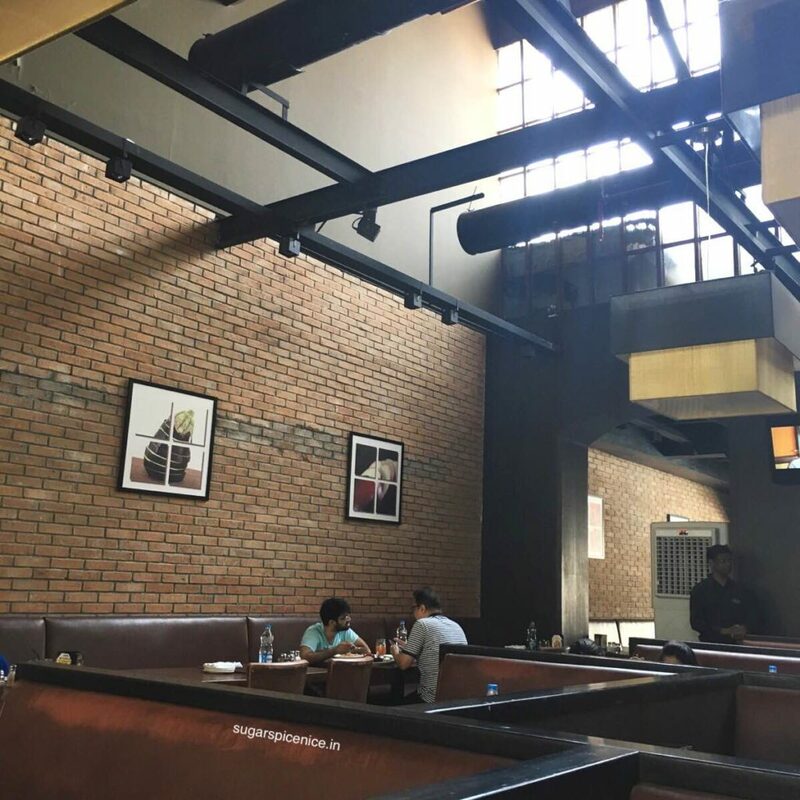 I recently tried out their outlet located in Todi Mills and got a little insight into their offerings. Tastes pretty similar to vanilla ice cream, but of course feels a lot lighter. And in my opinion creamier too. This is a creamy oreo flavored yogurt. A great replacement if you are craving a full on oreo cookie dessert. Feels like a fresh strawberry ice cream. 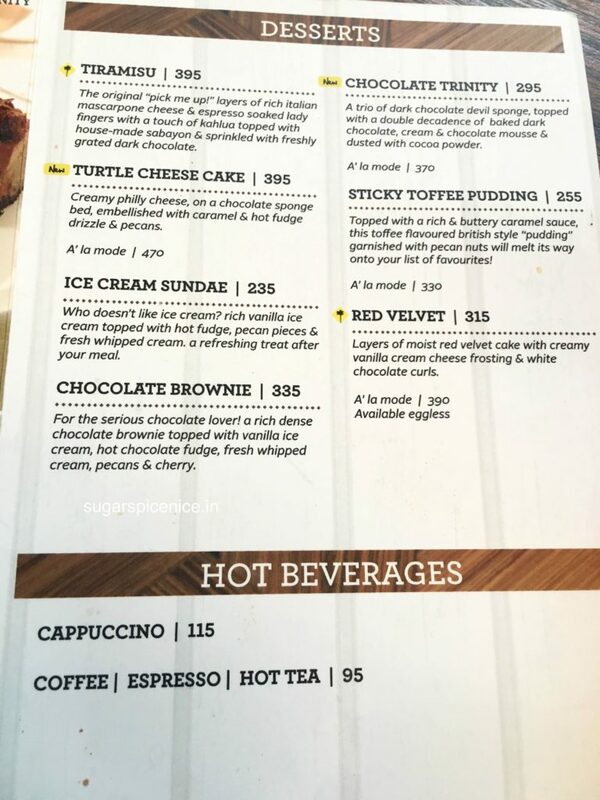 This one is sugar free – so if you are looking for that kind of an option you definitely have a chocolate one available. This is my favorite flavor from here – exactly like a good blueberry cheesecake should be. Definitely try it. It is their fastest running flavor. 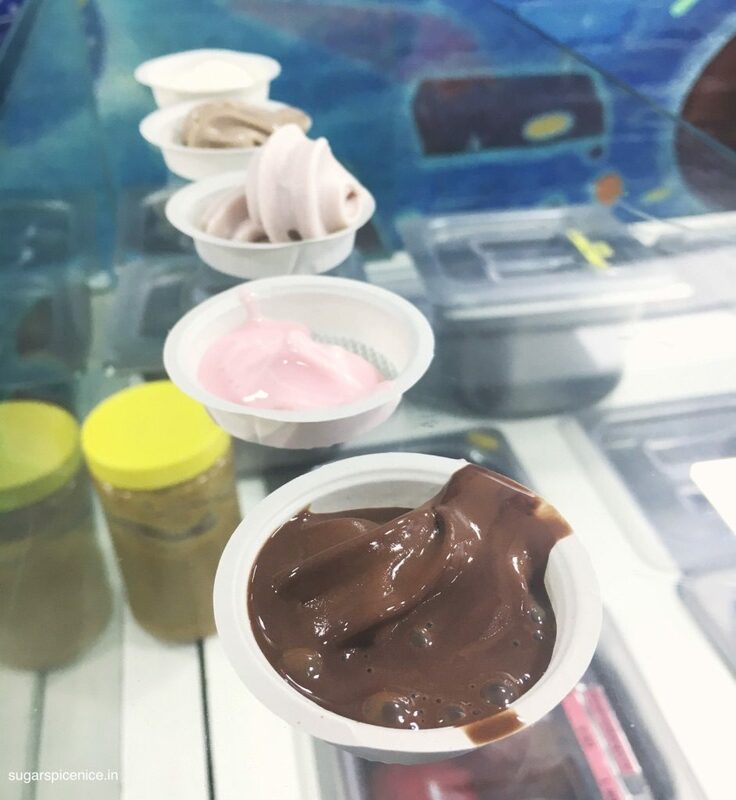 You can even select toppings of your choice to go with your yogurt – these can be fresh fruits like kiwi and berries, or just some chocolate chips. Or you can have some fun with sprinkles, jujubes and jellies. 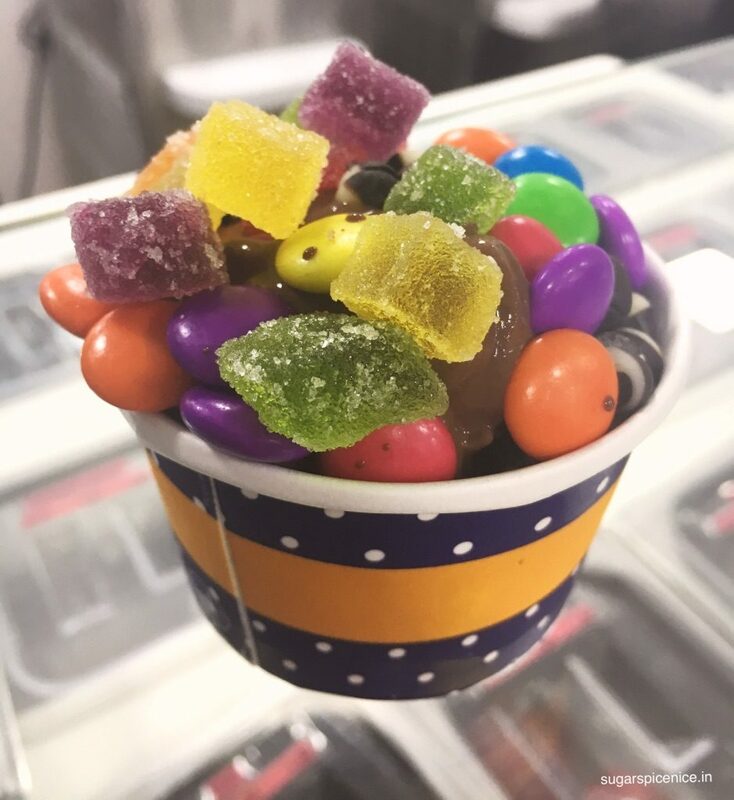 I enjoyed this Chocolate yogurt topped with some gems, some chocolate chips and a whole lot of jujubes. 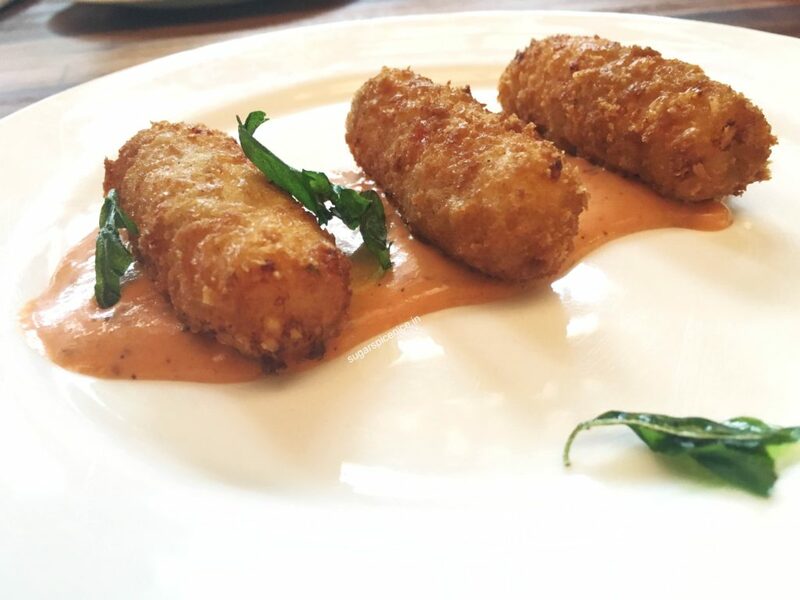 The Yogurtbay Lower Parel is 100% vegetarian. Even their waffles are eggless. To be honest, the my experience with the waffles at yogurtbay wasn’t all that top notch. I tried their belgian chocolate waffle which is just covered in chocolate of all forms. The waffles feel slightly chewy. 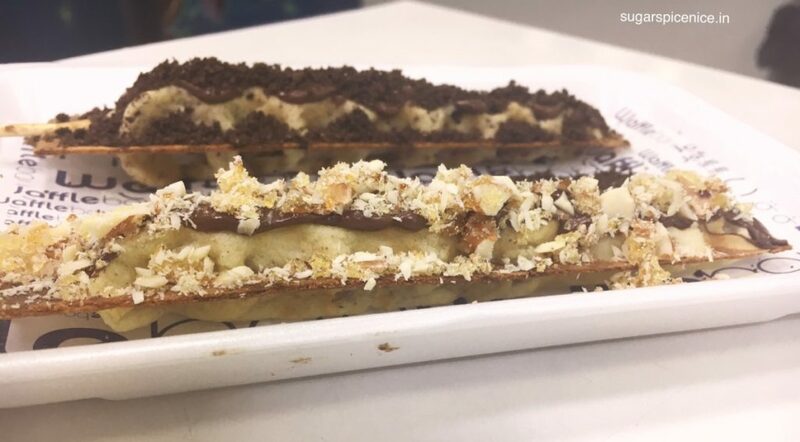 I also tried the Nutella one – it has some white chocolate, almond chips and some caramelized sugar. This one is quite nice – only if the nutella were a little more generous I would definitely enjoy it more. For vegetarian waffles there are definitely more places that I would rather go to. 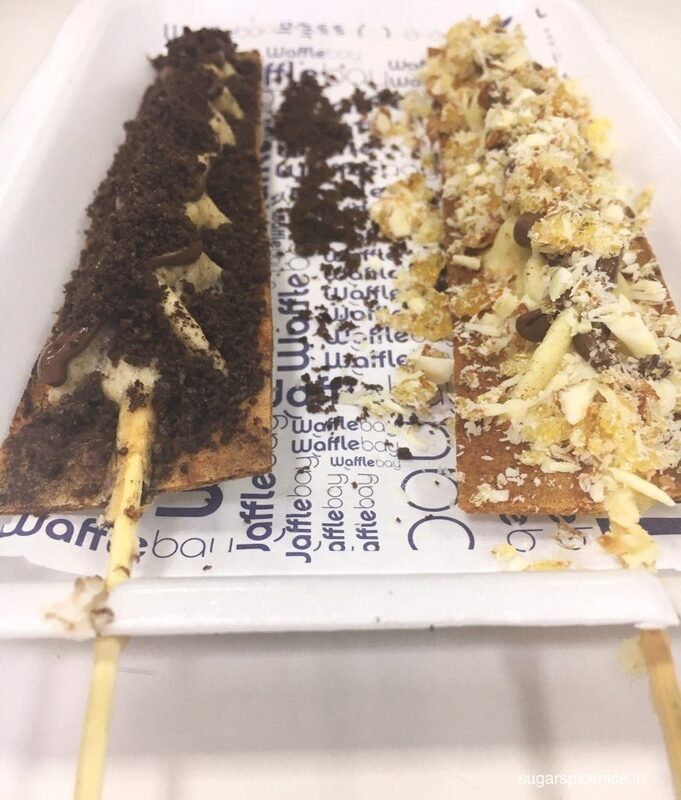 I will give it to them though for their presentation – waffle on a stick. Makes it pretty convenient to eat. So that was it from my visit to Yogurtbay Lower Parel. I do really recommend their yogurt. Do try it out if you get a chance. 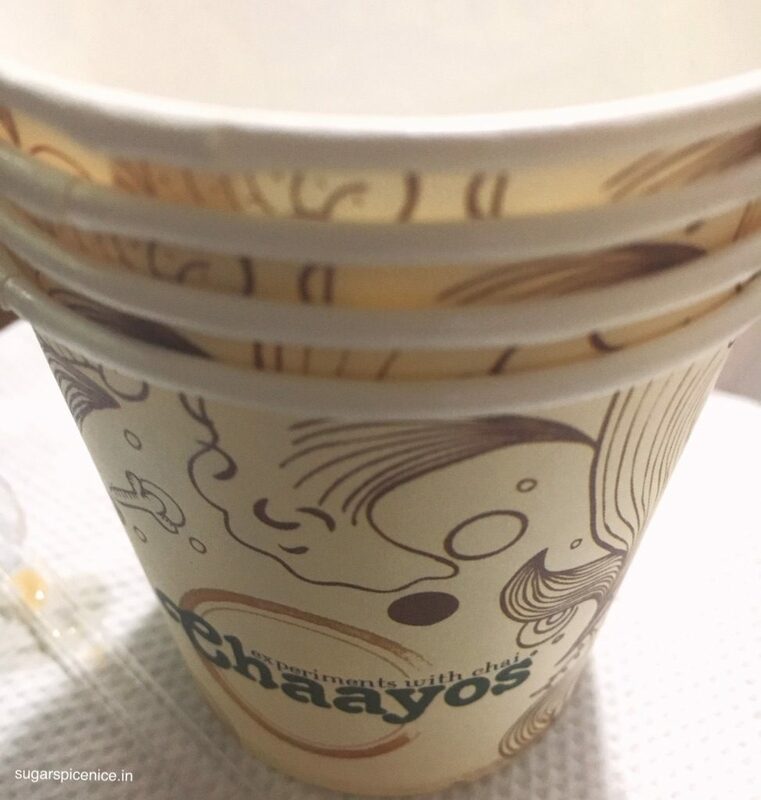 Chaayos Lower Parel almost became a convenient ordering in and chai place for me. But off late, the quality seems to be a bit off the radar. 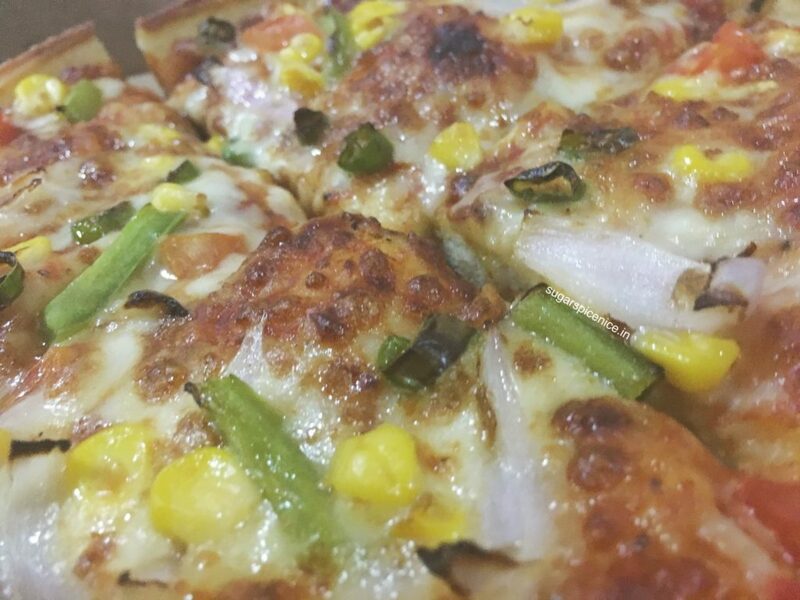 Not just the quality – even the overall taste. 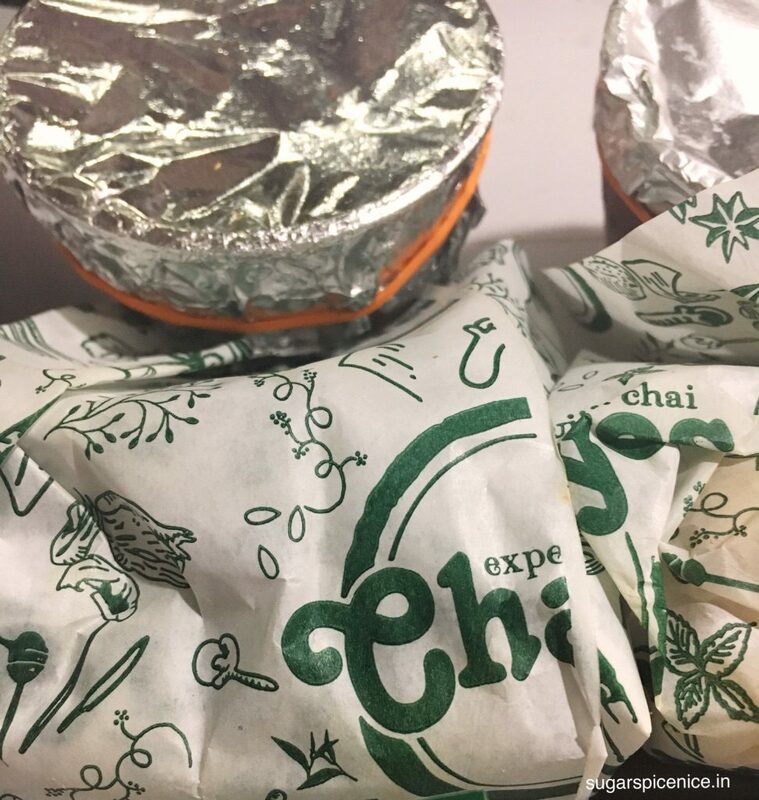 So here’s a summary of my most recent order from Chaayos Lower Parel. It comes in this earthen kulhad. And the portion size is pretty good. You get 2 Kulhad’s and 2 pavs. The ingredients however feel aweful. 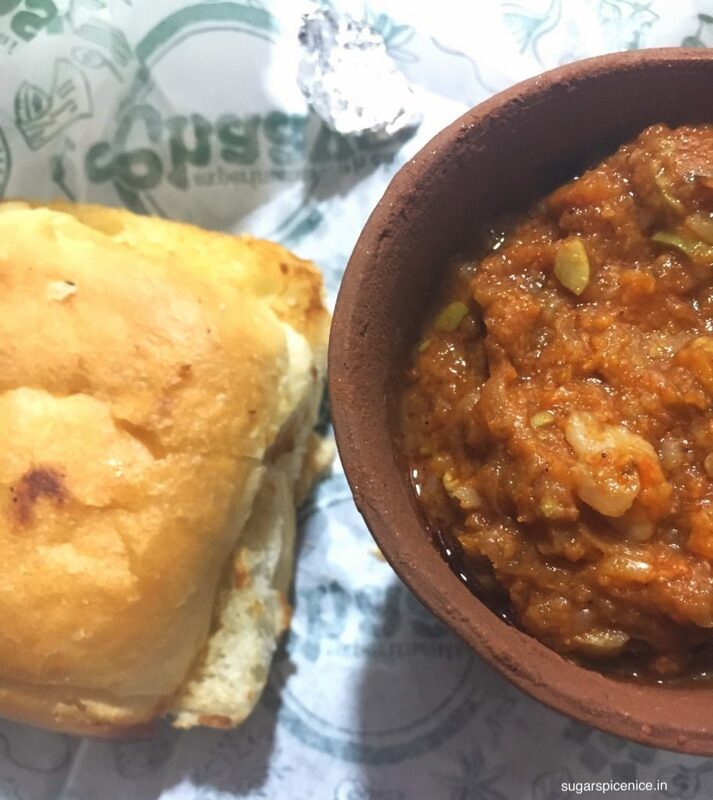 It tastes like an over masaledaar subzi and that nice buttery taste that needs to be there in the bhaji seems missing. They do give you Amul Butter to go with it. But that’s not enough to cut it! And the bhaji had some peanuts in it! Which didn’t feel good at all. Even the Pav was super dry and almost crumbly. 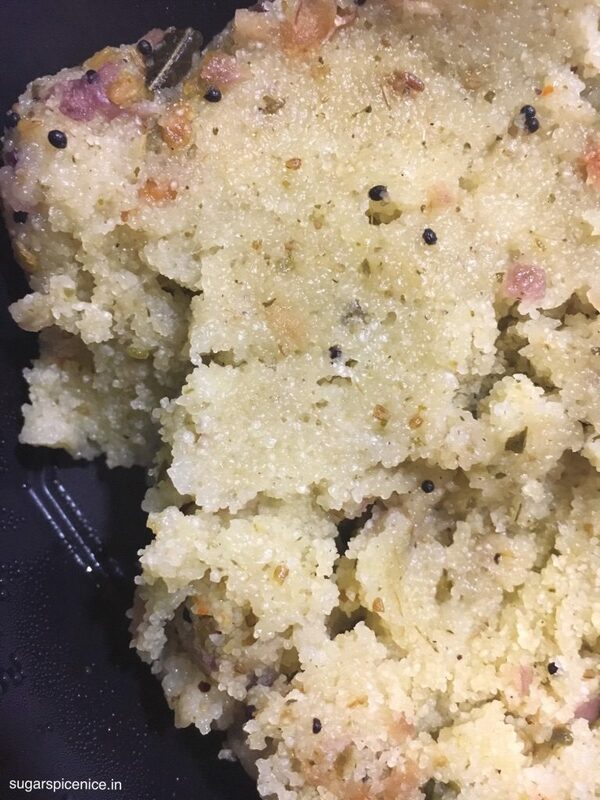 Homestyle Upma – another one from the winter menu. This just feels dry and mealy. No substance to it at all! It has some basic vaghaar and that’s about it. Just like a couple of really fine pieces of tomato and thats all. 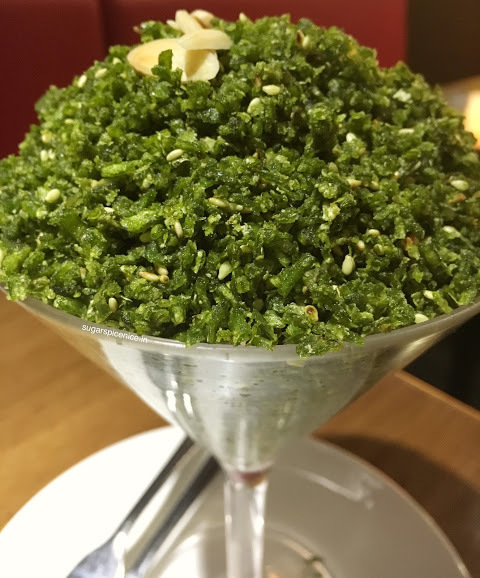 I used to honestly quite like the poha from Chaayos earlier. It used to seem pretty hot and fresh and was quite tasty as well. 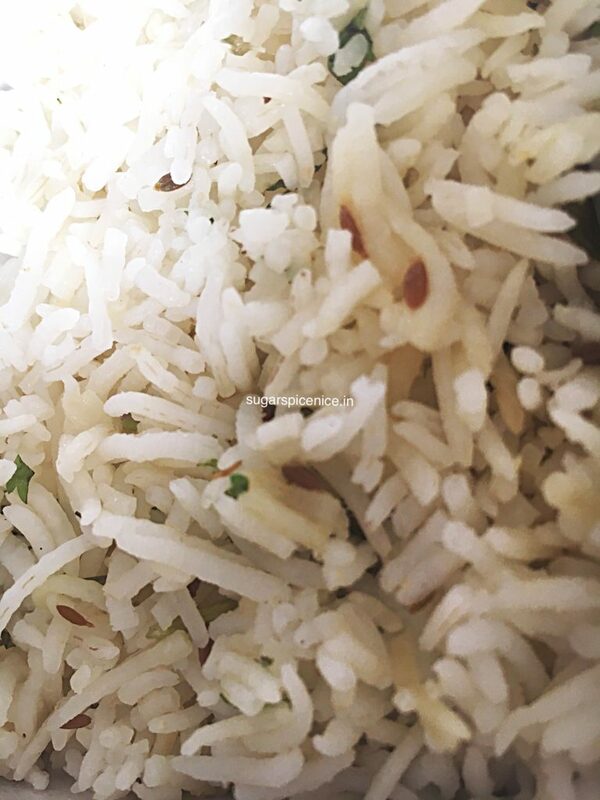 This I would say was homestyle poha – fluffy and delicious. 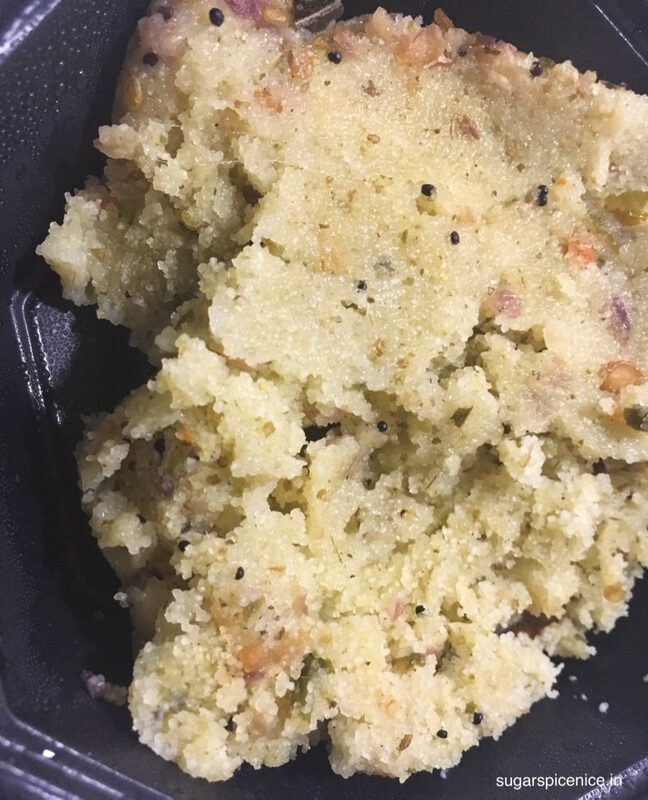 But what I got this time was just poha that was totally moist and really aweful tasting. Once poha is over cooked or re heated too many times it kind of gives away and that’s what this one felt like. 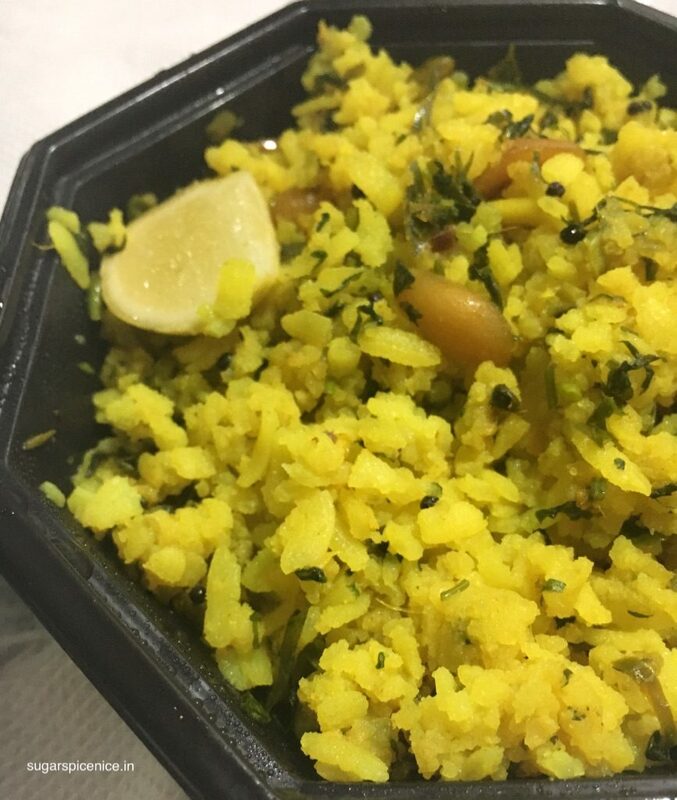 And it’s not because I home delivered it – I’ve had poha from them via delivery almost all the time. Thankfully this they still do right. Desi Chai, chose kadak patti, dudh kam and adrak, mint and tulsi for a slightly nippy evening. Felt good after all the other stuff bombed! 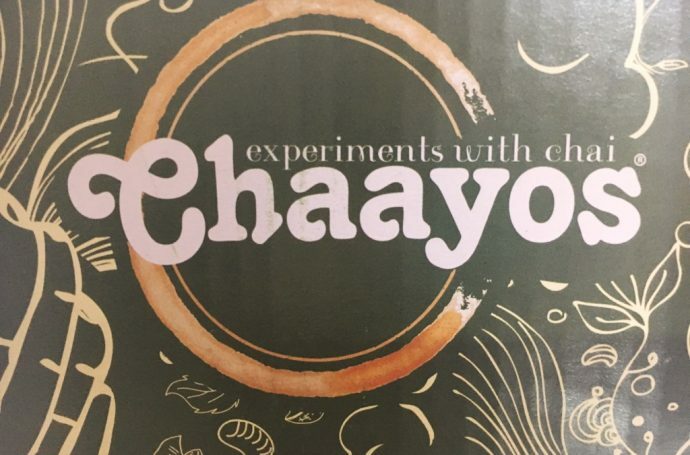 And their chai packaging is pretty impressive too. 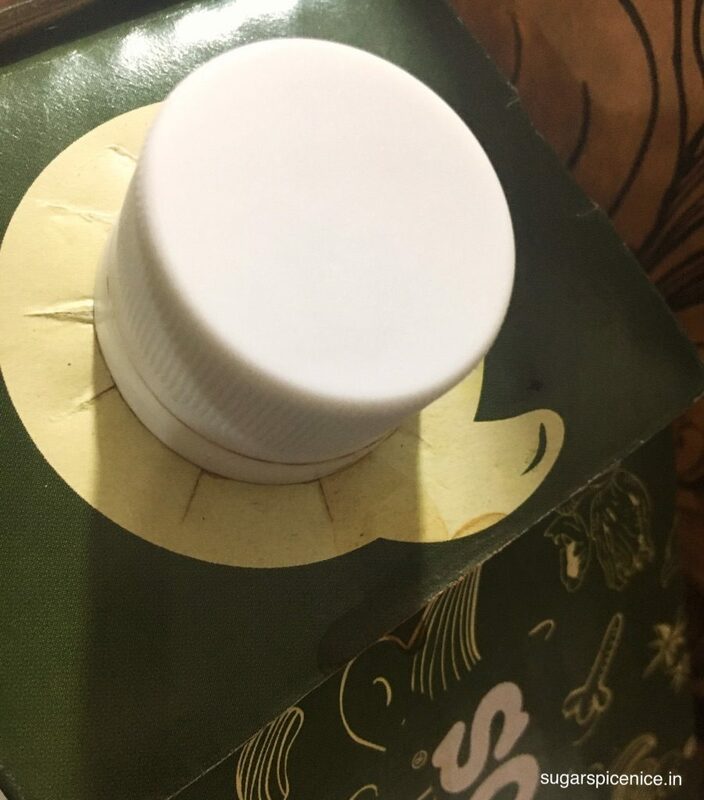 Carton kettle with a plastic twist cap and inside is another almost flat bottle kind of holder. 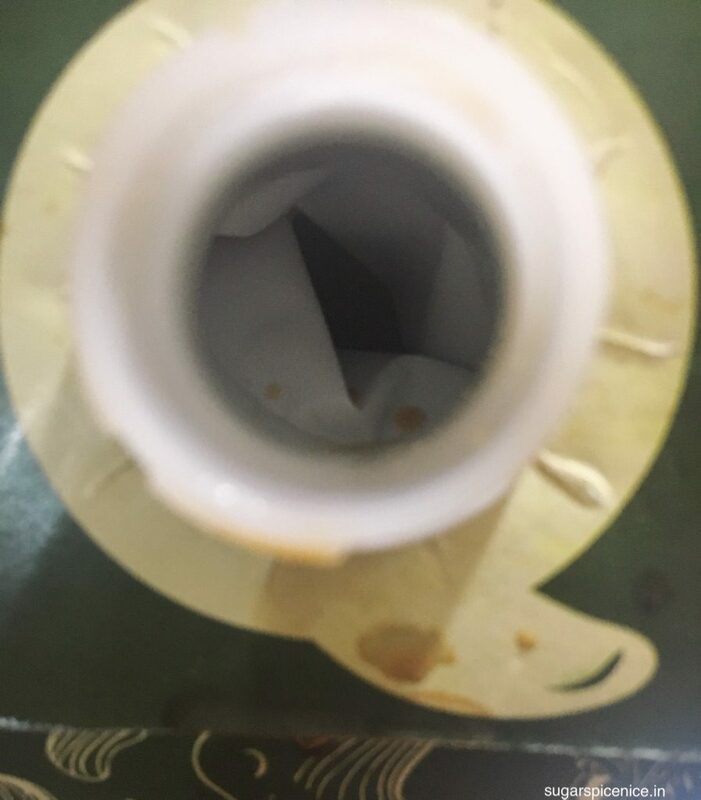 And the chai has no leaks or spills. They do charge an additional 30 bucks for packaging though! 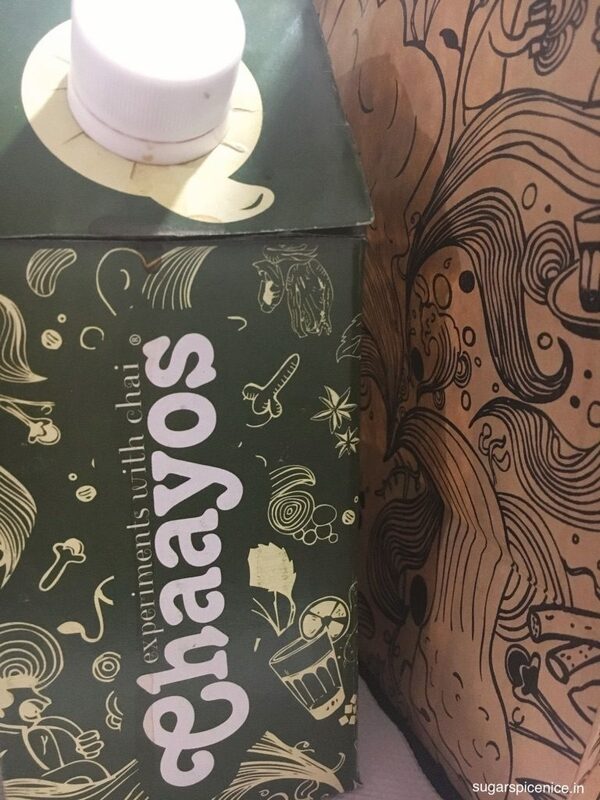 So this was my most recent experience with Chaayos. 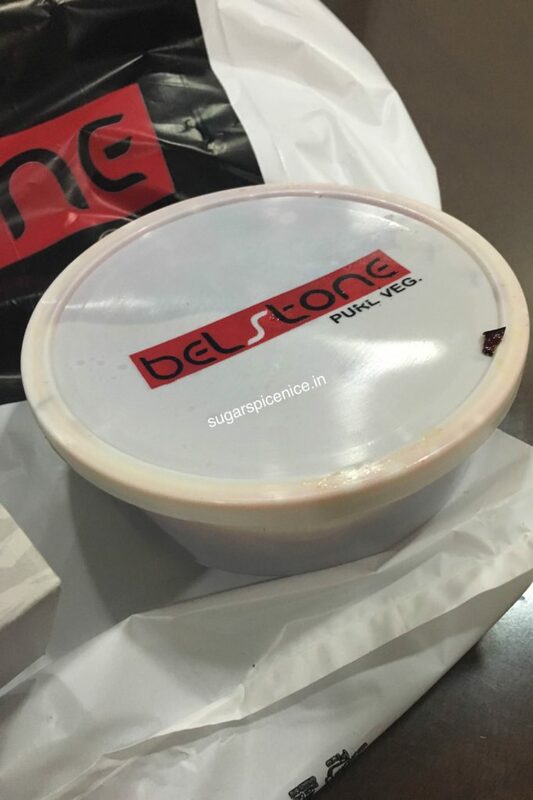 I have rated them earlier on Zomato very highly (4.5) and now I’d change that to 3. 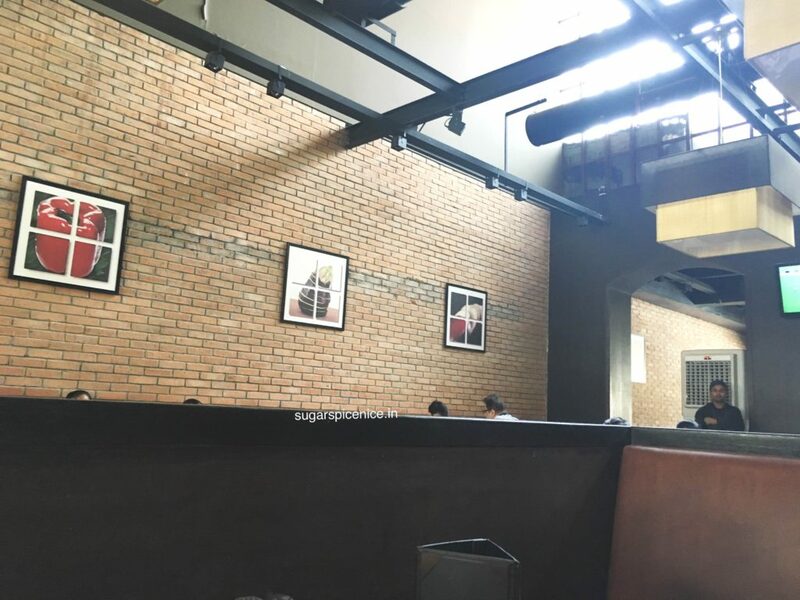 To be honest, their chai got them to 3! I hope you enjoyed reading. And let’s be in touch for more food stories. 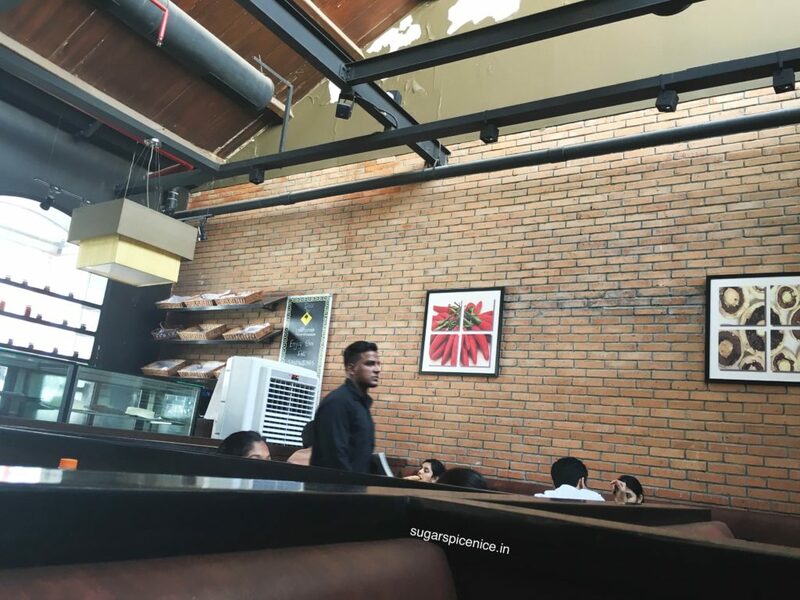 Jamies Pizzeria Mumbai – Overrated? 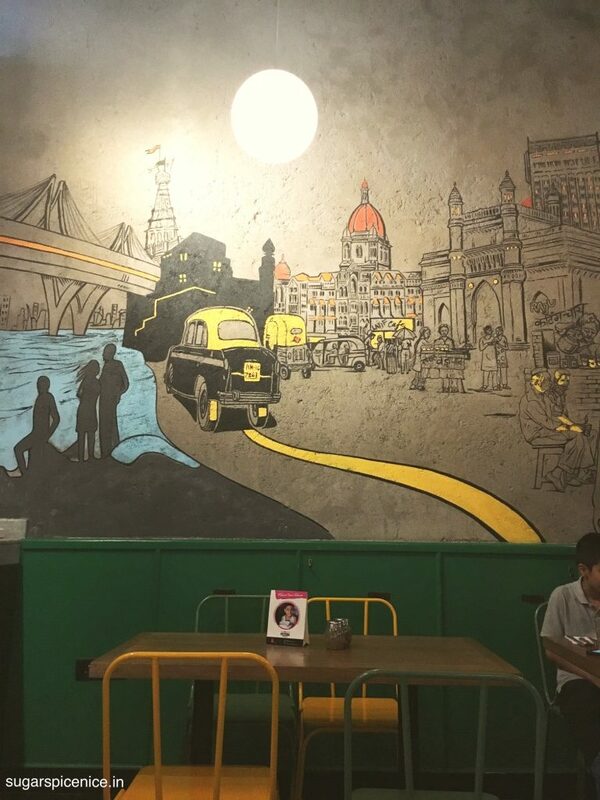 After at least a dozen recommendations from fellow foodies, friends and family, I tried out Jamies Pizzeria Mumbai. Talk about being super late to a party! When a restaurant is highly recommended, the Gemini in me gets way too active. On one hand I’m super excited to try out the place and be one with all the people who love it, and on the other hand I’m kind of really trying hard to not build that many expectations. 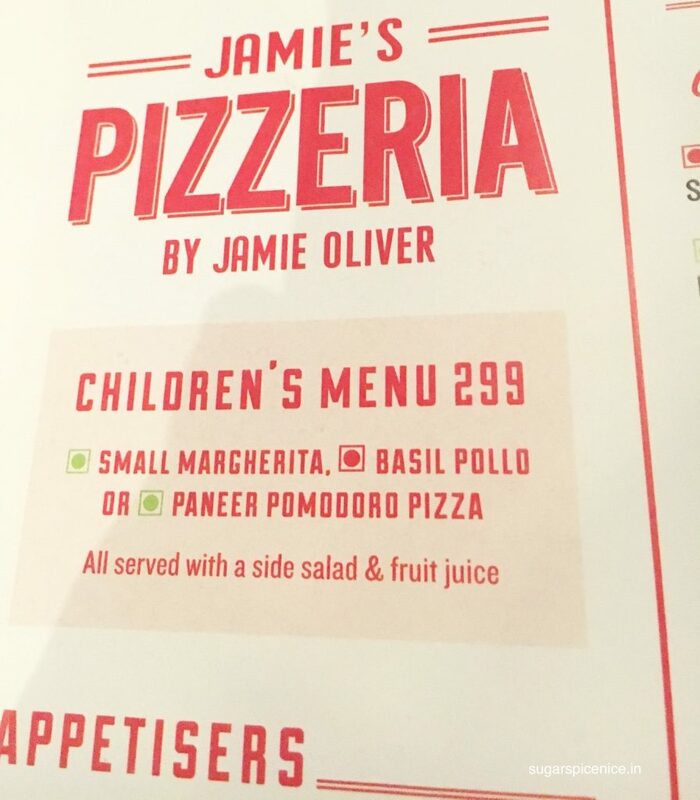 And Jamies Pizzeria Mumbai wasn’t left out of this thought process either. Firstly, a moment of silence that Haagen Dazs shut down and made way for Jamies. I mean, WHY? Why God why did it have to go. Anyway, after all of that emotional drama, I got down to ordering some food and I ordered some salad, some pizza and a beverage. I started with their Rocket Salad. 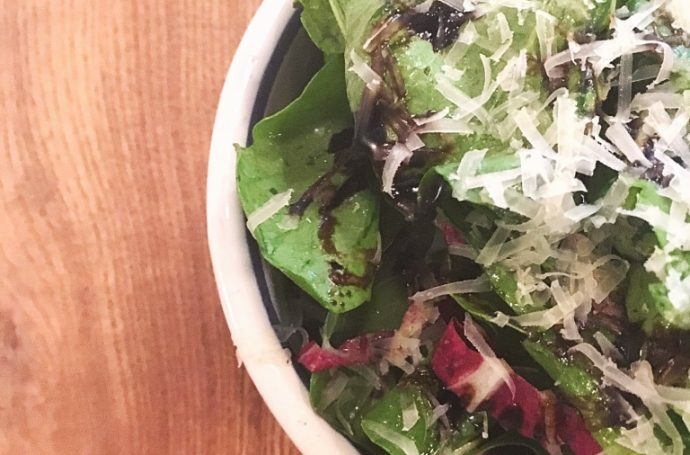 A petite portion of fresh rocket leaves, some parmesan cheese in an extremely understated balsamic flavor. 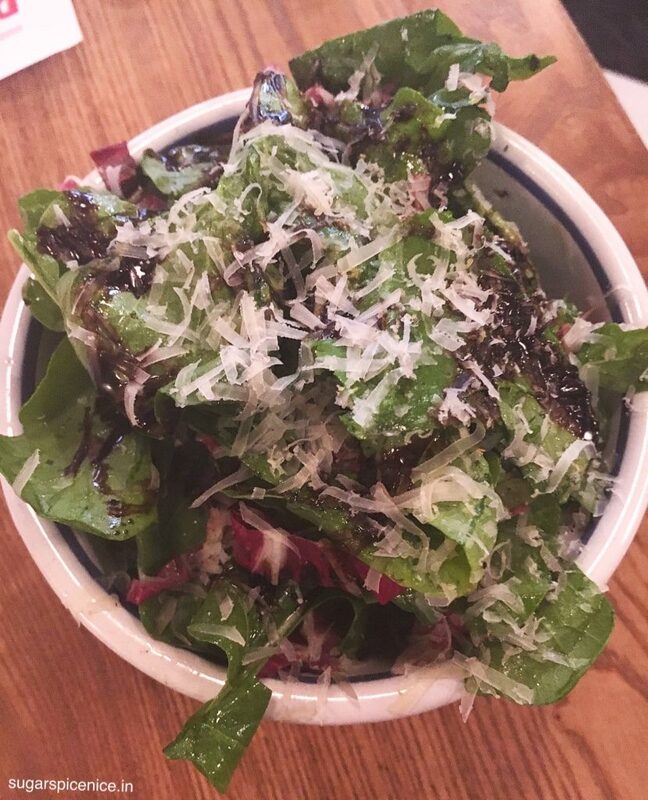 You have gotta love your leaves if you have to like this salad because the dressing is really mild and the actual rustic flavor of arugula is what you end up with. 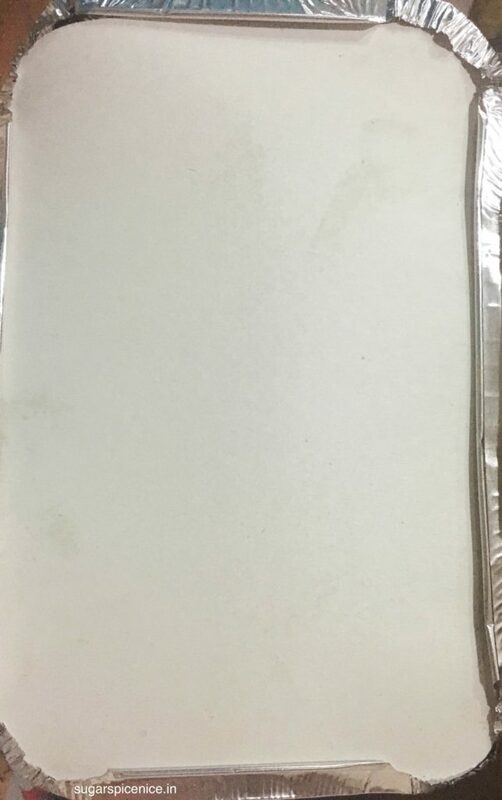 Even the cheese is really minimal. I honestly did quite enjoy this. 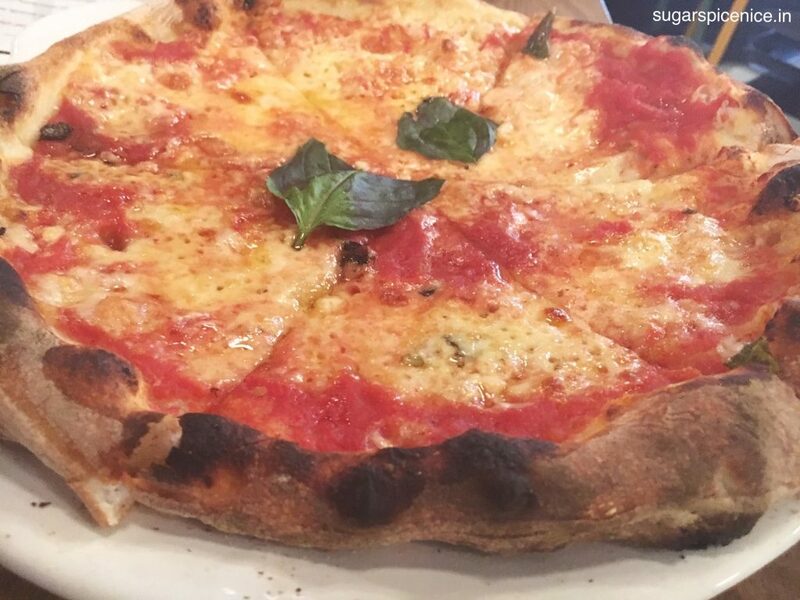 Coming to the next item – which for me is the TRUE test for a Pizza place – the MARGHERITA! I ordered one here too and went in immediately for a big bite. You know when there’s too much excitement and anticipation and your first bite is well…just about ok. The pizza base was really good. I didn’t have any trouble eating even the non sauce part at all. The tomato sauce I felt could have been a little more tangy and flavorful. I mean it was ok, and not something that I could rave about. 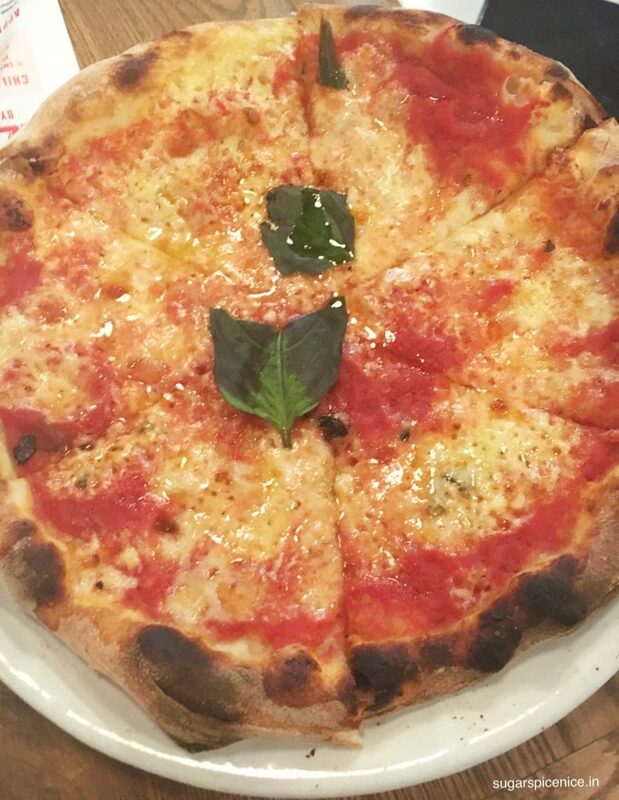 Honestly, I feel Pizza Express does their margherita splendidly well. 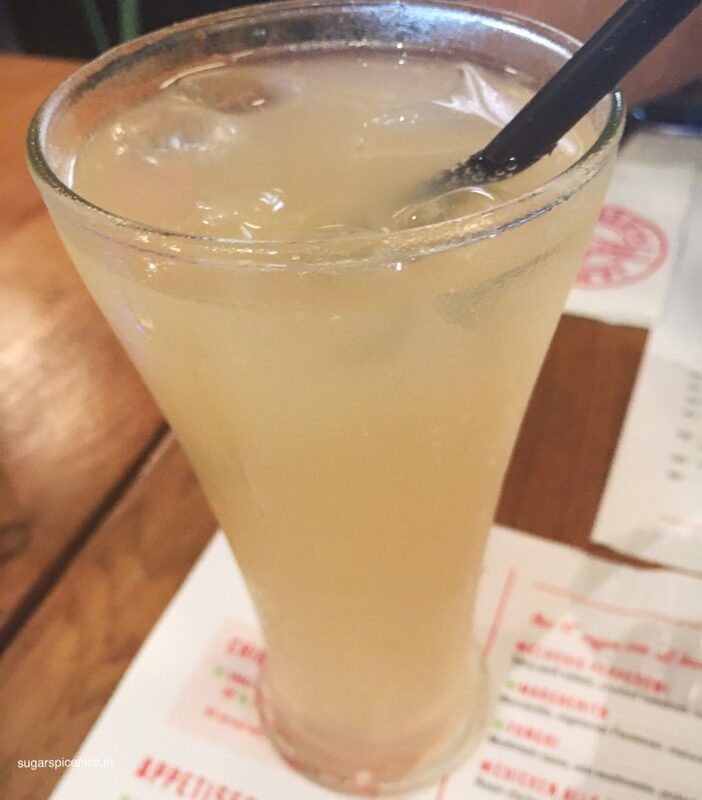 I sipped on their Ginger Beer all throughout my dinner and I thought it was one of the best ginger drinks I’ve had in a while. No fizz and really good. So, coming to the ultimate question – Will I go back here? May be …may be not. 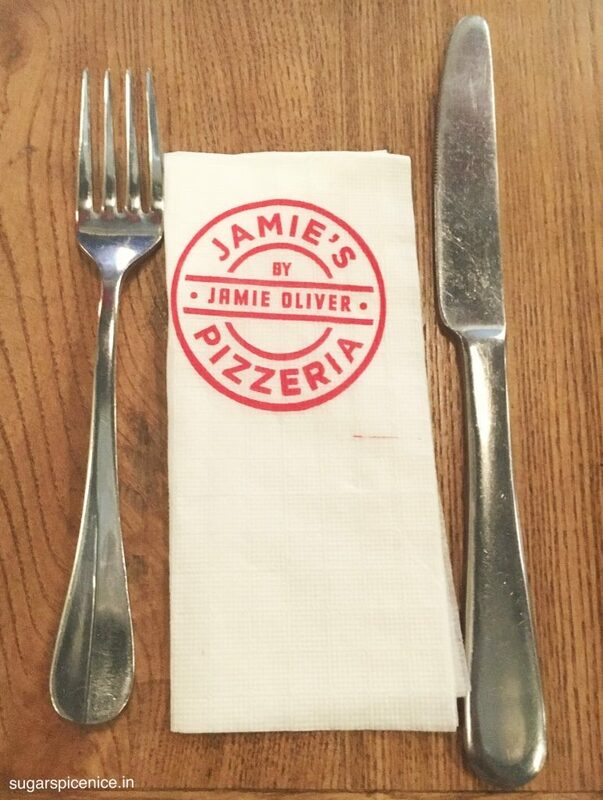 Have you tried Jamies Pizzeria Mumbai? How did you like it? Let me know in the comments! 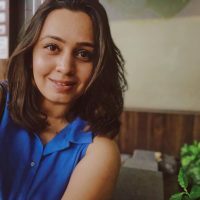 Want to stay updated about with my everyday food stories? Follow me on my social media! 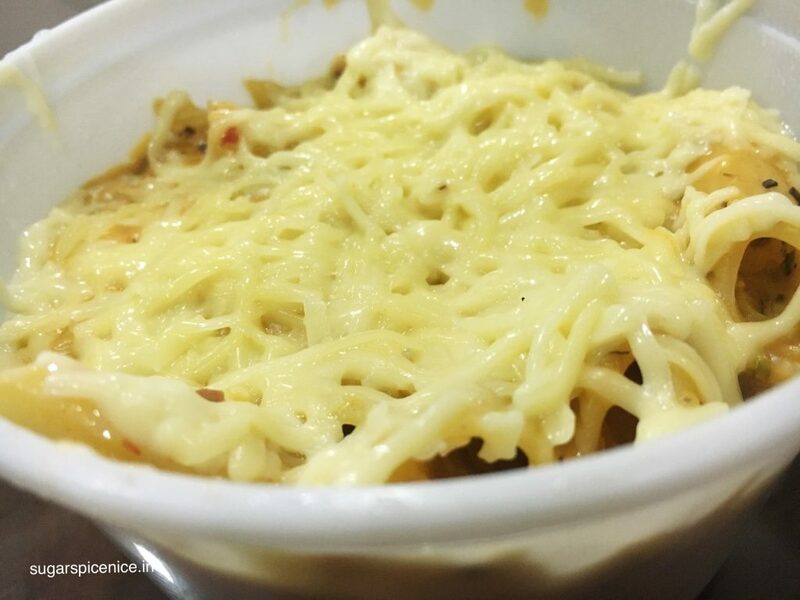 Can there ever be an excess of cheese? No right! 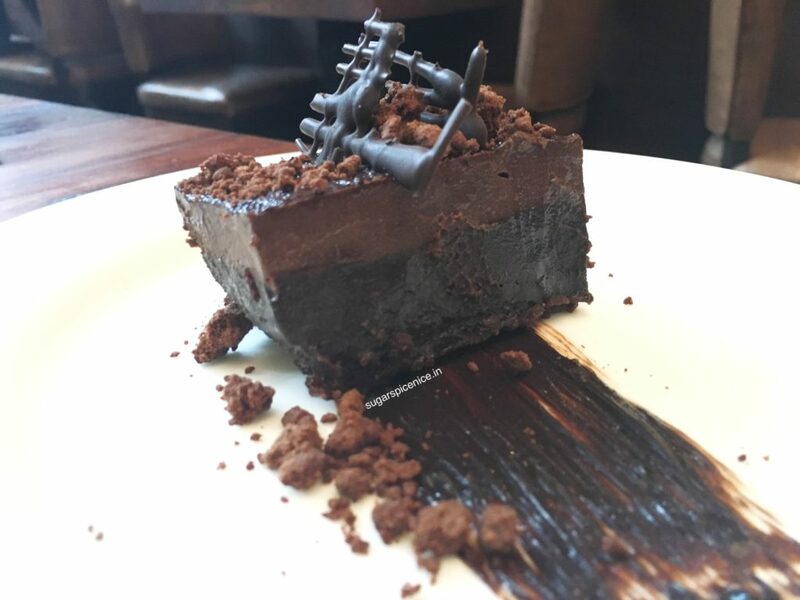 WOW Bake and Grill in Lower Parel can give you loads of yummy cheesilicious stuff from their menu. 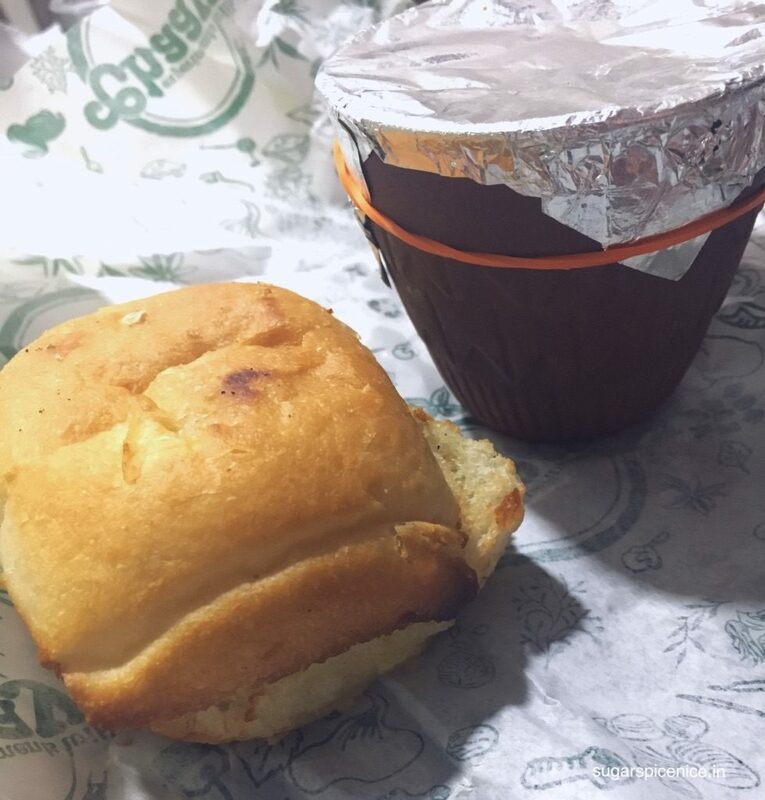 I recently tried some stuff from WOW Bake and Grill and absolutely loved it. It’s a great option for delivering to your doorstep if you are in this area. 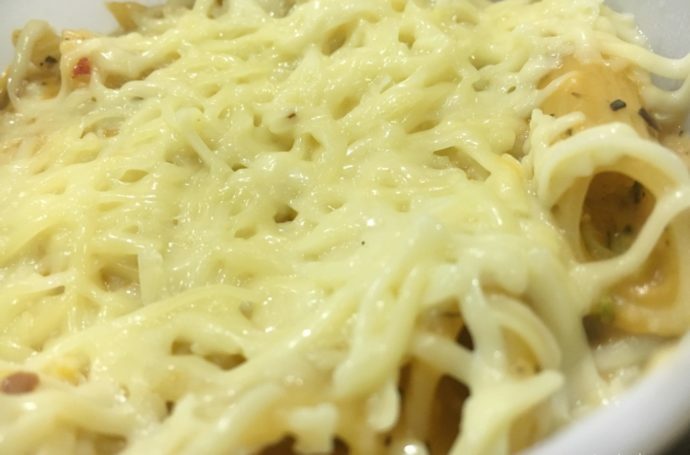 Spicy, cheesy pasta. 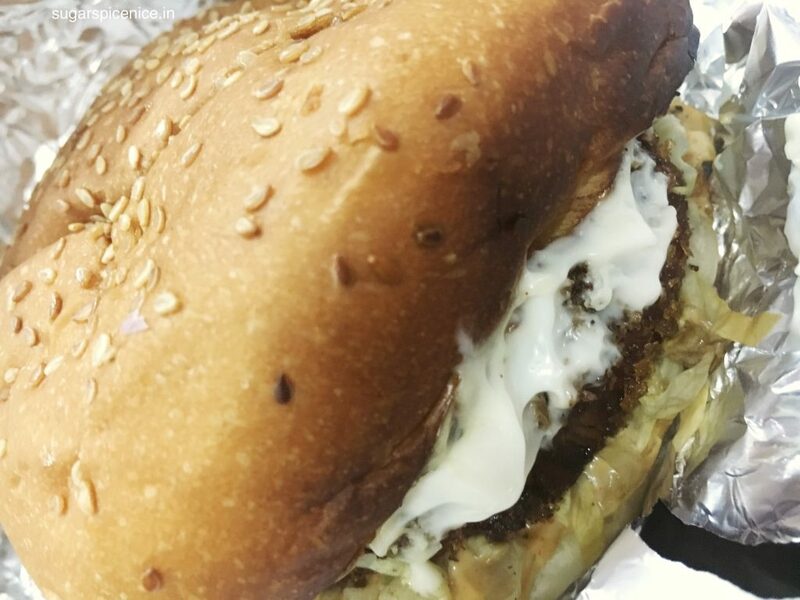 LOADS of cheese and a good, albeit creamy mix of red and white sauce. WOW Bake and Grill is so generous with their cheese! 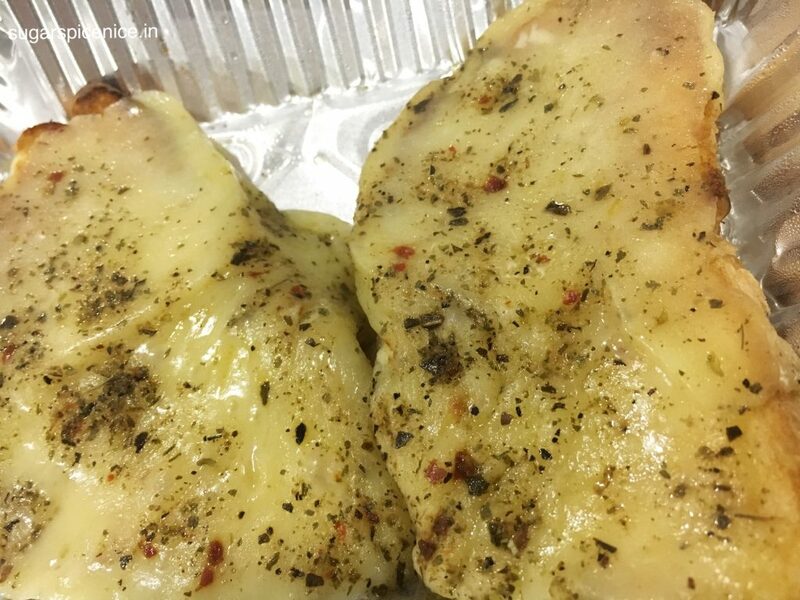 It’s a lot of cheese on warm garlic bread. Cannot go wrong with this one. Spicy AF! But it’s impossible to stop eating these. Because my food was home delivered, I had to try to reheat these and once I did, they were as good as new. This is something which I didn’t enjoy too much. 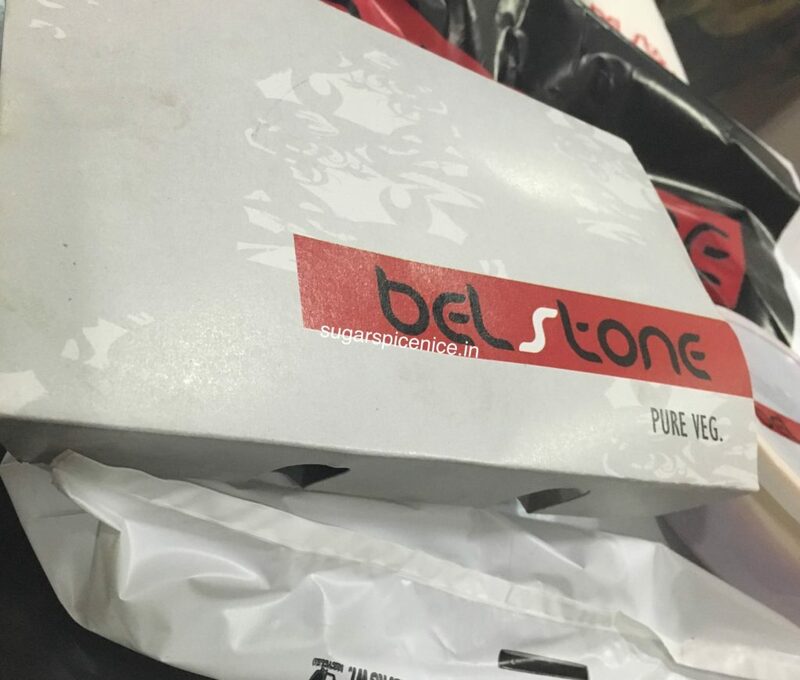 It was a try on item – which means it’s not yet on their menu. 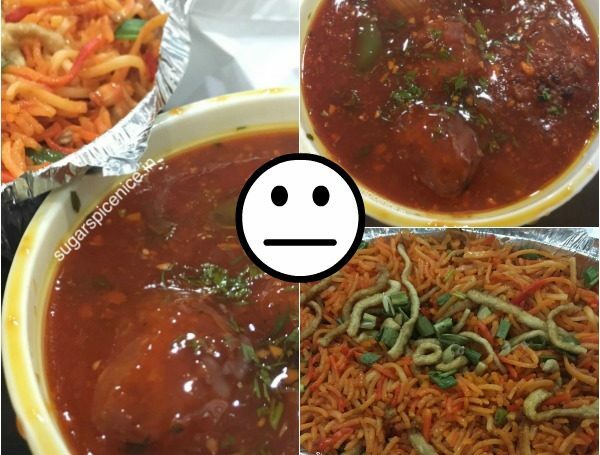 But somehow the sour kind of taste and paneer didn’t work for me. 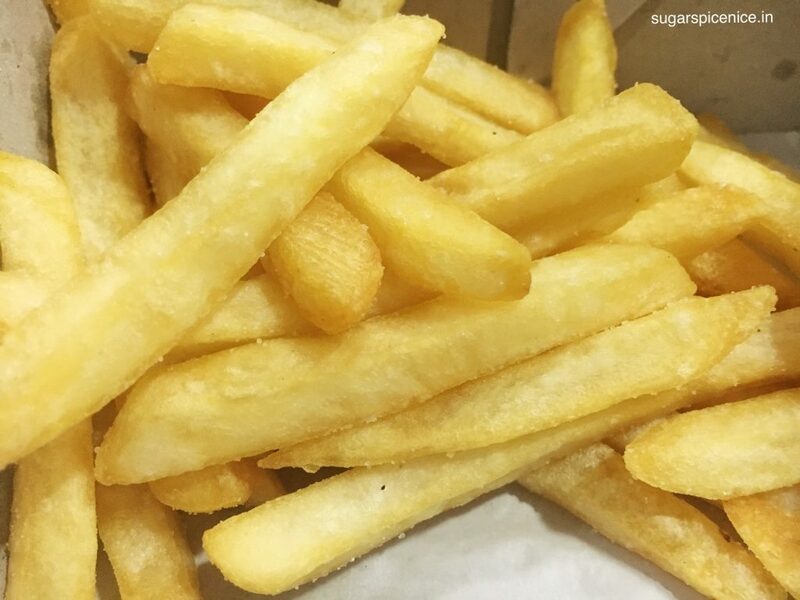 However, the fries that came with it were spot on! 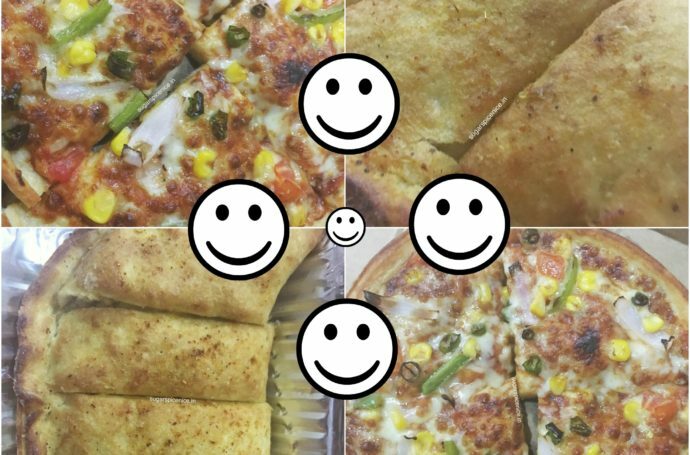 If you are in this area, then you know you can order from WOW Bake and Grill to fulfill some cheesy cravings! 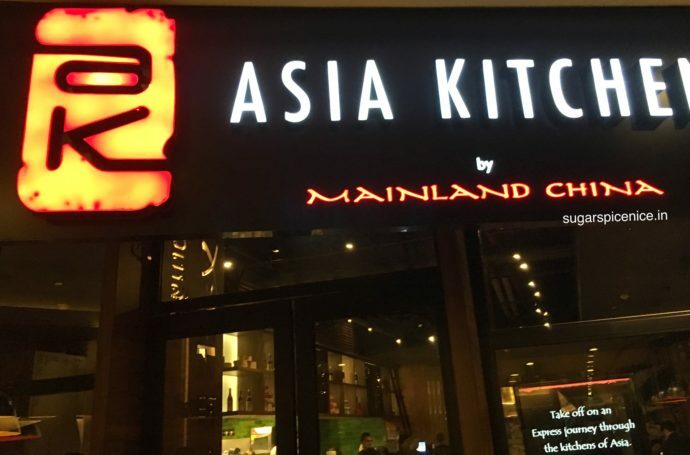 Asia Kitchen By Mainland China EatThis! 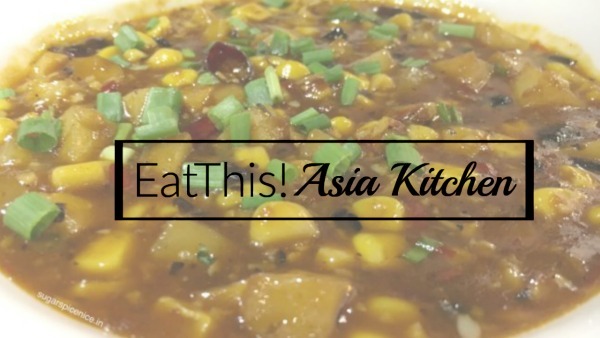 You have gotta #EatThis when you visit Asia Kitchen by Mainland China. 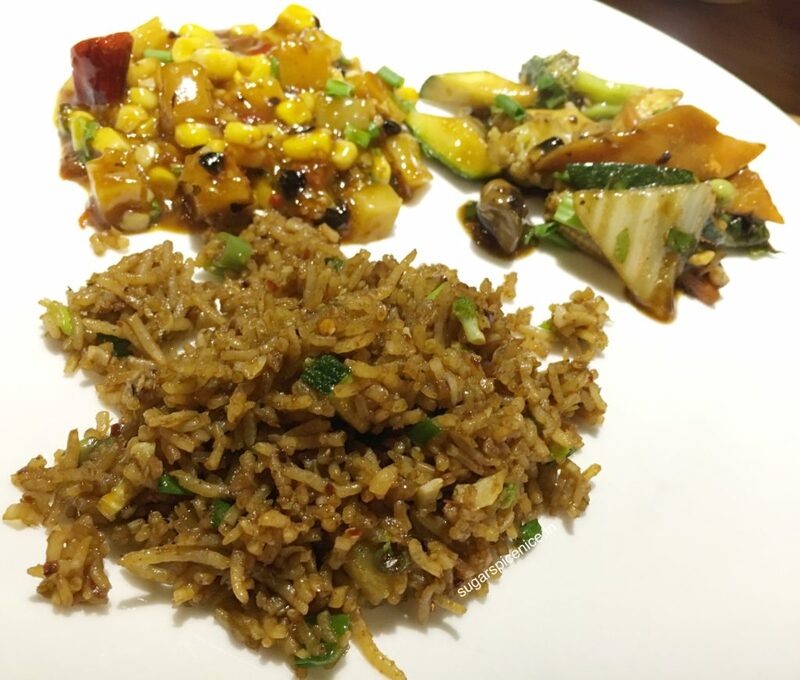 Asia Kitchen by Mainland China is one place where I loved everything that I ate. 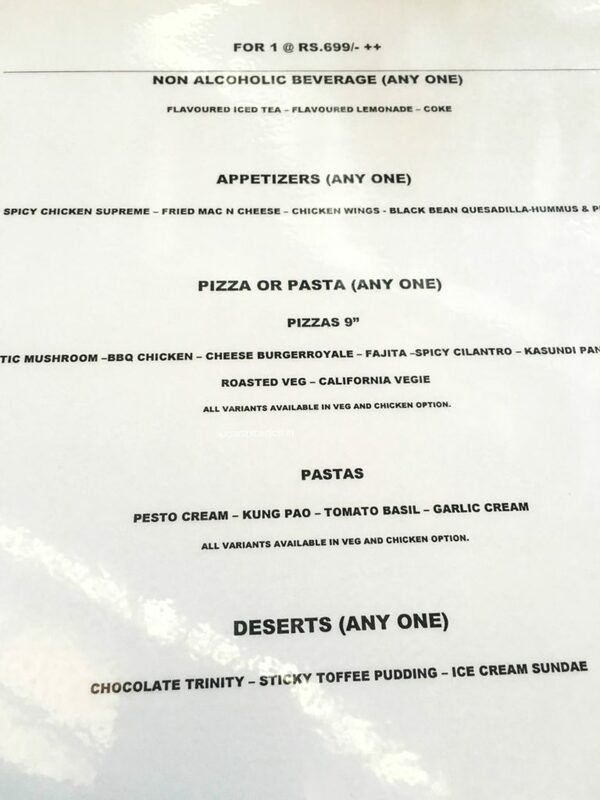 Each and every item was delicious! Quick review of each of these items is below. 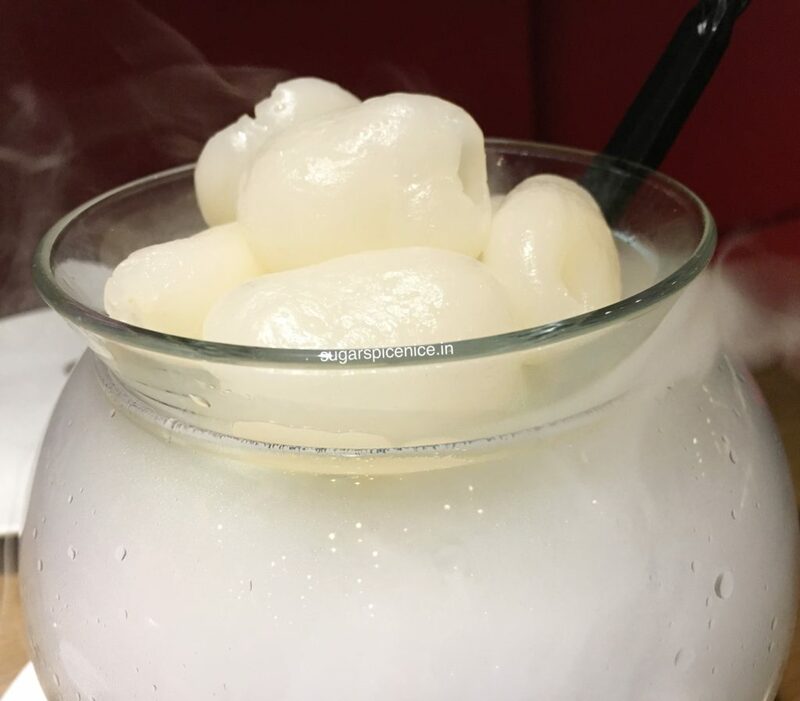 Will appear on your table as a welcome gesture. I bet you, you won’t be able to stop popping these. 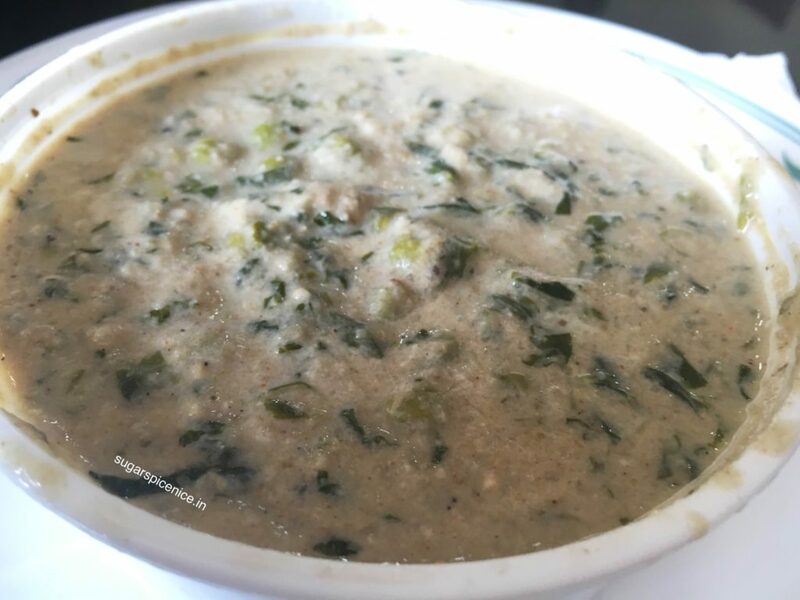 Thick and creamy and doesn’t feel like an excess of corn flour. It’s got a little bit of veggies in it. Absolutely loved this. 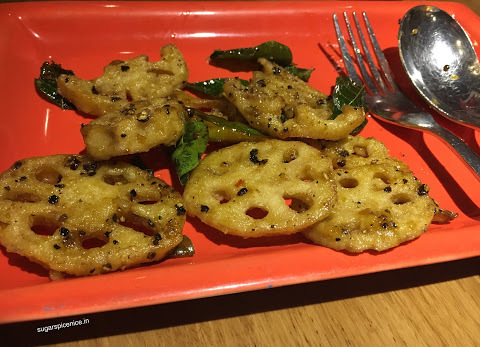 Never thought I would love lotus stem. 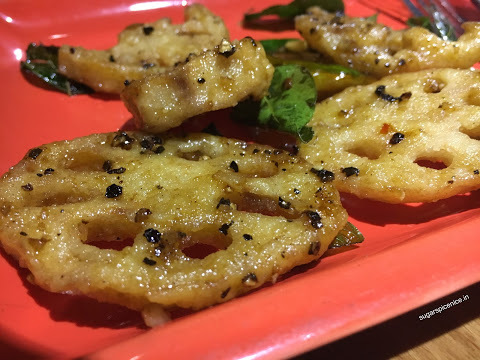 The flavor of the Lotus stem and curry leaves together had me totally gorging on this. 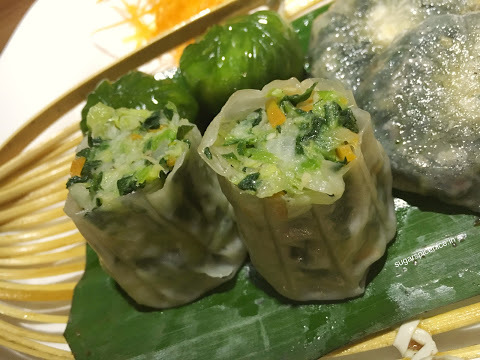 Tried one with spinach and the other with veggies – Cabbage , carrots etc. 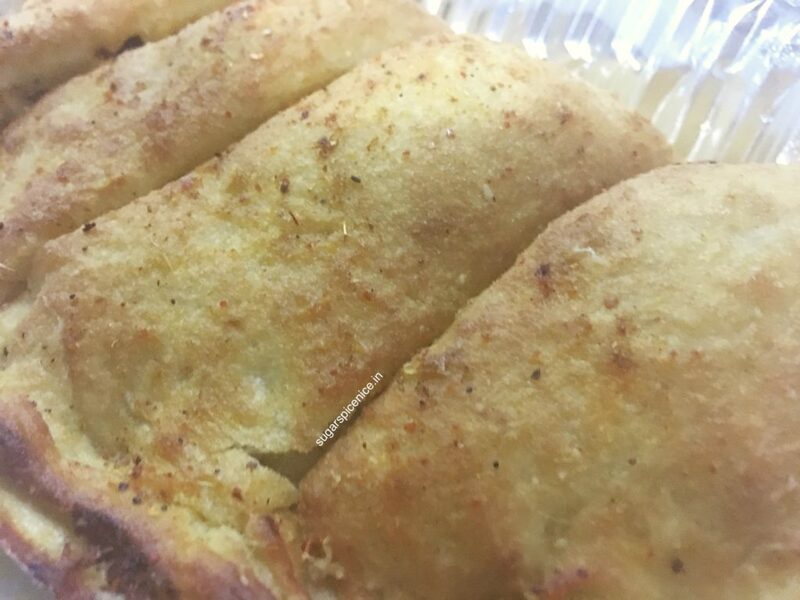 The outer covering is soft and melt in your mouth. Veggies inside are so flavorful. Spinach doesn’t feel bitter. 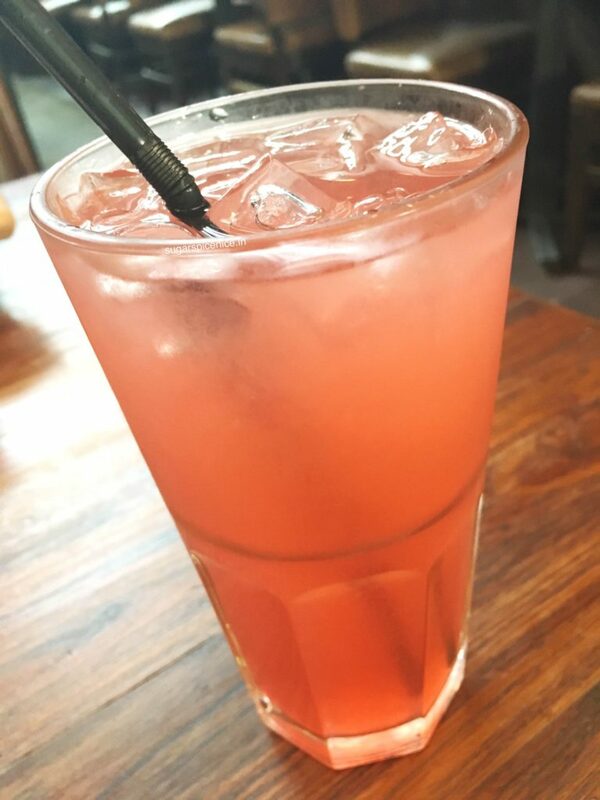 This is such a nice sweet and sour flavor – feels really light and refreshing. 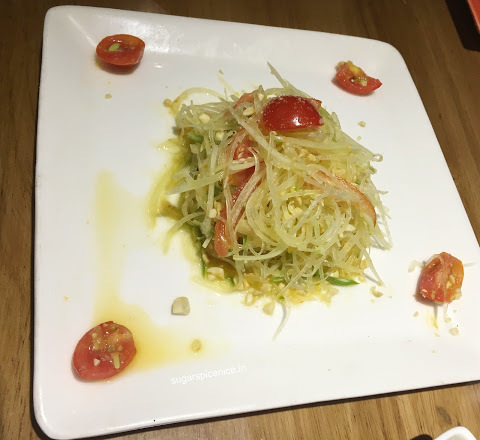 Finely chopped raw papaya, some tomatoes and a little bit of capsicum – very tasty. 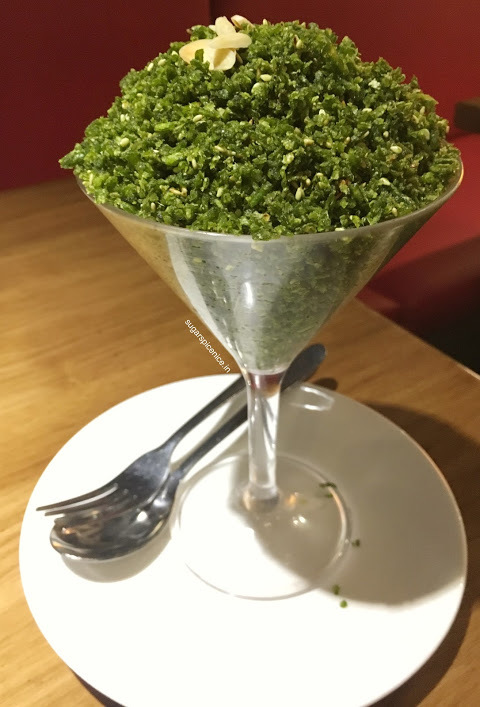 Loved the way this was served – looked so bomb sitting pretty in a martini glass. Slightly different than the other places I’ve had crackling spinach – this was even tinier bits and not whole leaves. Add had a slightly different, but good flavor. And was definitely the least oily one I’ve had. 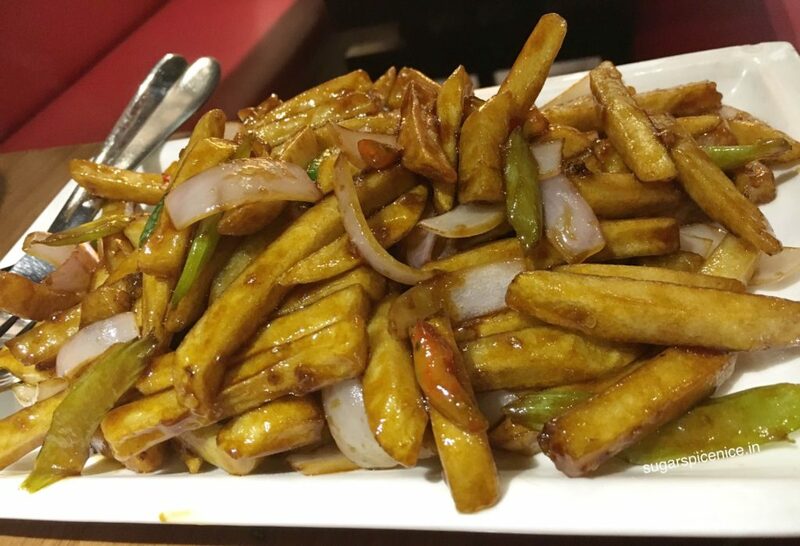 A slightly different version of the regular honey chilli potato – Teriyaki gave a nice sweetish flavor and I love any tossed / fried potato. So I obviously totally loved this. 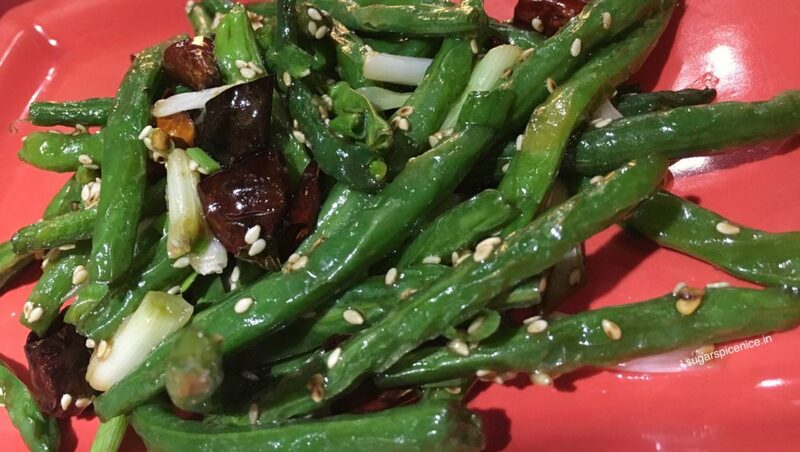 Main course started with some stir fry beans – green beans with some spring onions, chilli and sesame seeds. 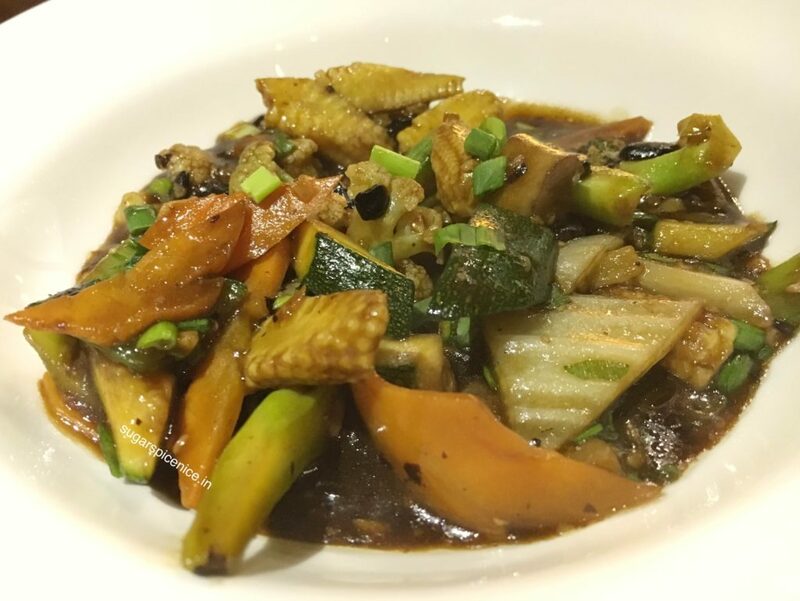 I usually am not the biggest fan of stir fry veggies but this was so yum! 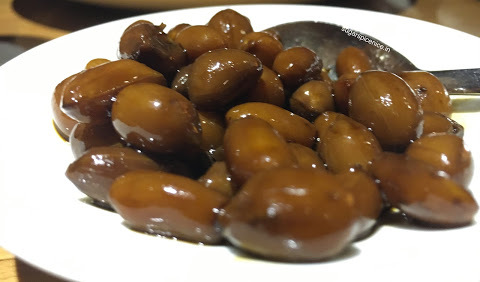 Black bean sauce done perfect – no weird taste that sometimes black bean sauce can have. Veggies included zucchini, carrots, broccoli, corn, onions. I don’t like black bean sauce either but this one was quite nice. This is STELLAR. 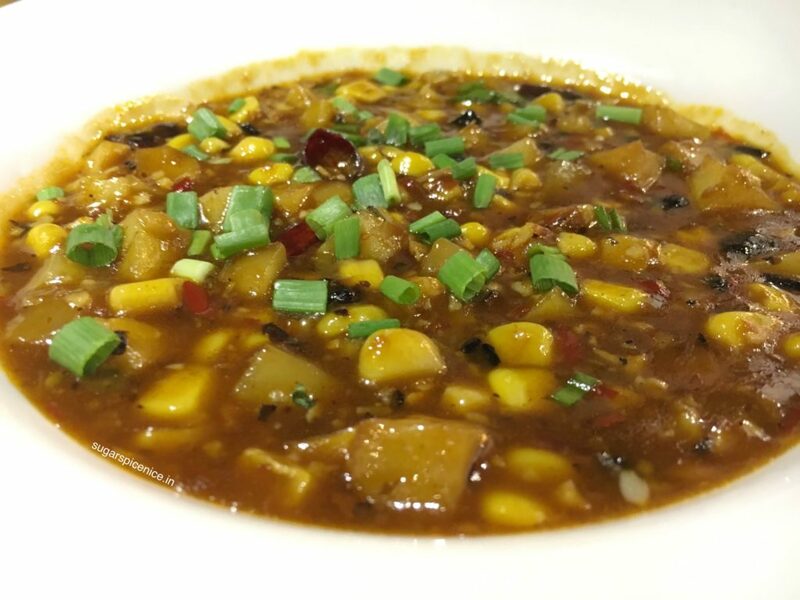 A nice hot sauce felt like hunan mixed with something milder and corn, potatoes and water chestnut. It is going into my most favorite gravy list. You have to try this. 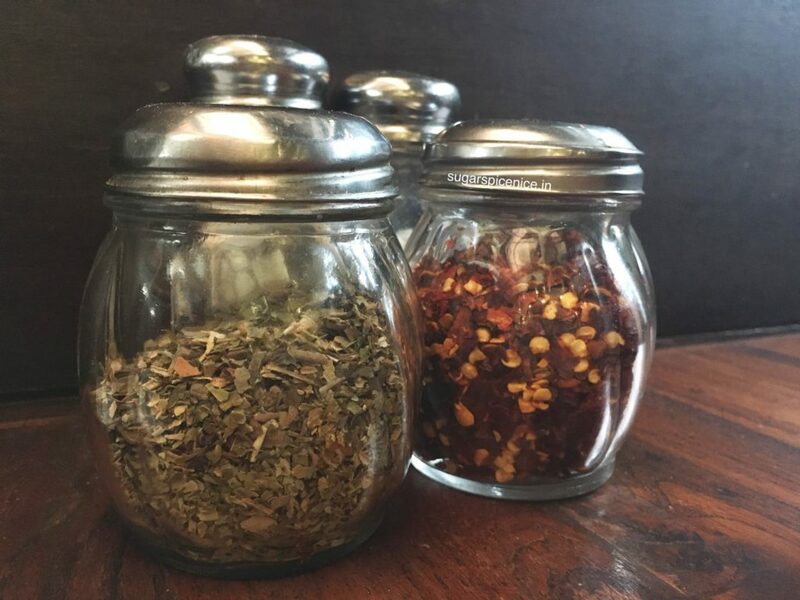 Heavy flavor – I personally liked it. 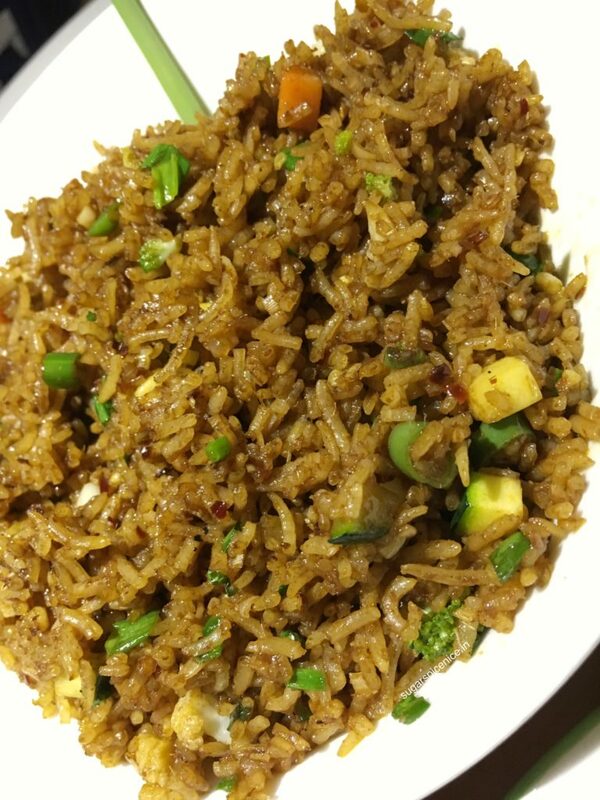 If you are ok with a heavy flavor going on in your fried rice then you will love it. 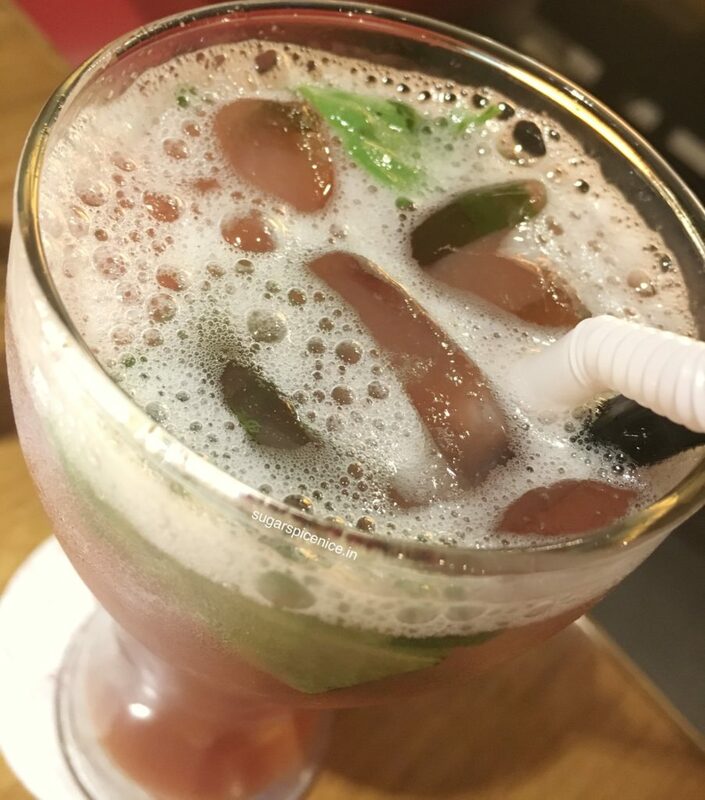 Guava juice and basil – fresh and refreshing. Highly highly recommend this one. 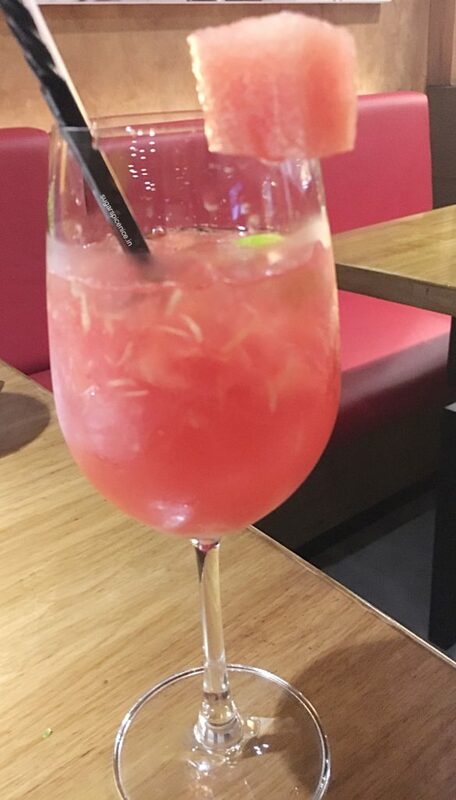 Watermelon juice, some ginger and lime. 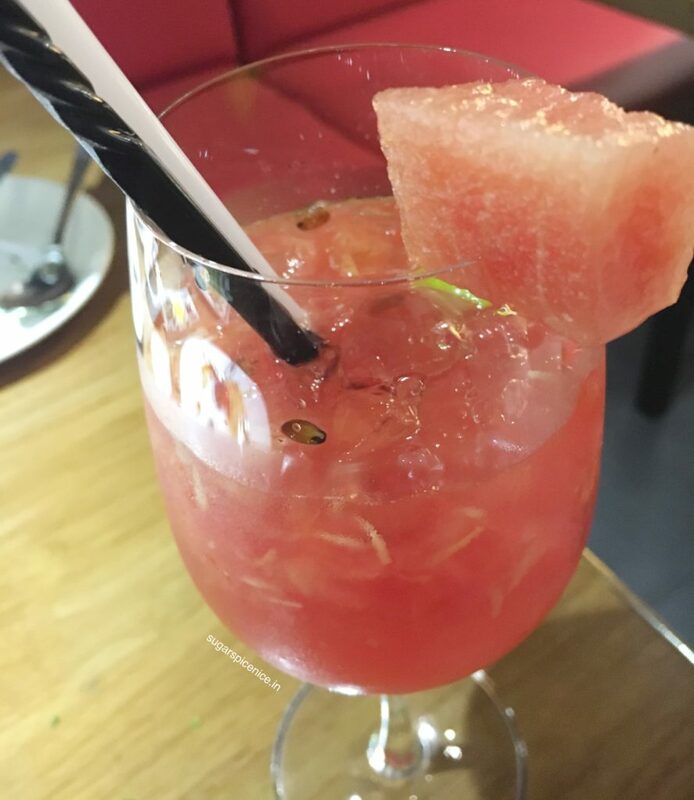 Ginger and watermelon is such a great combo. 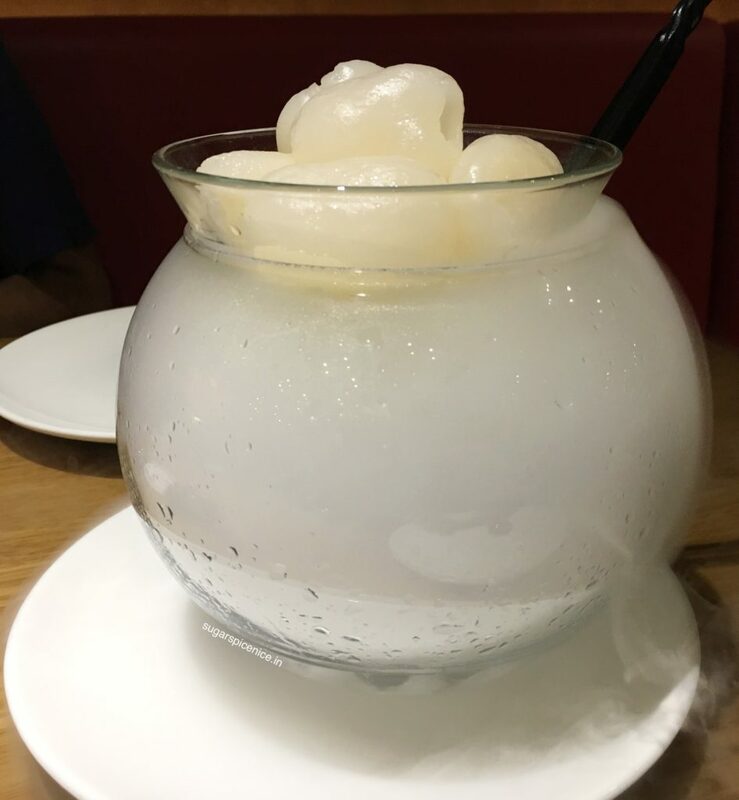 Literally came in glass bowl with a whole lot of vapor! 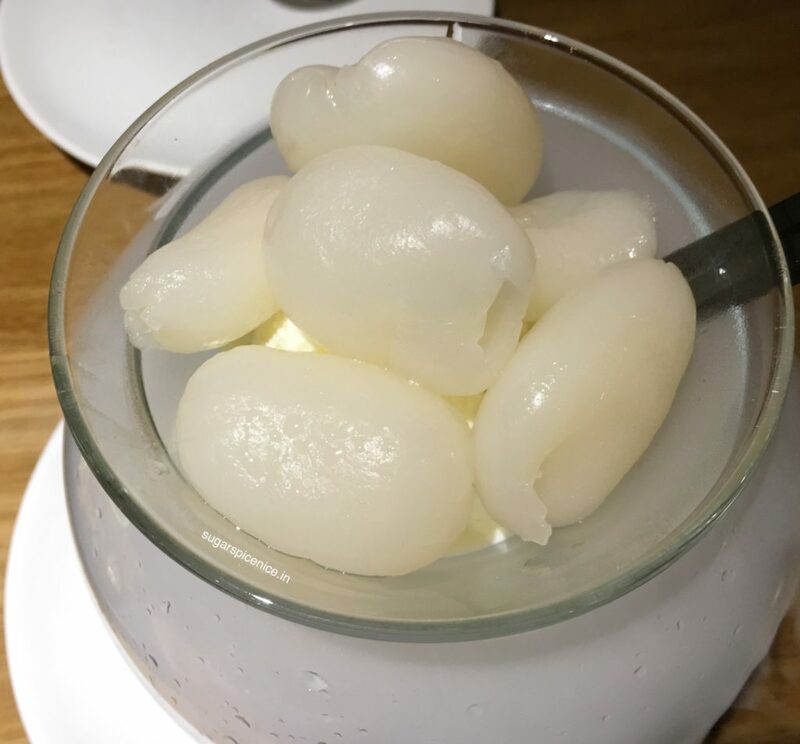 Deseeded Lychee – win! 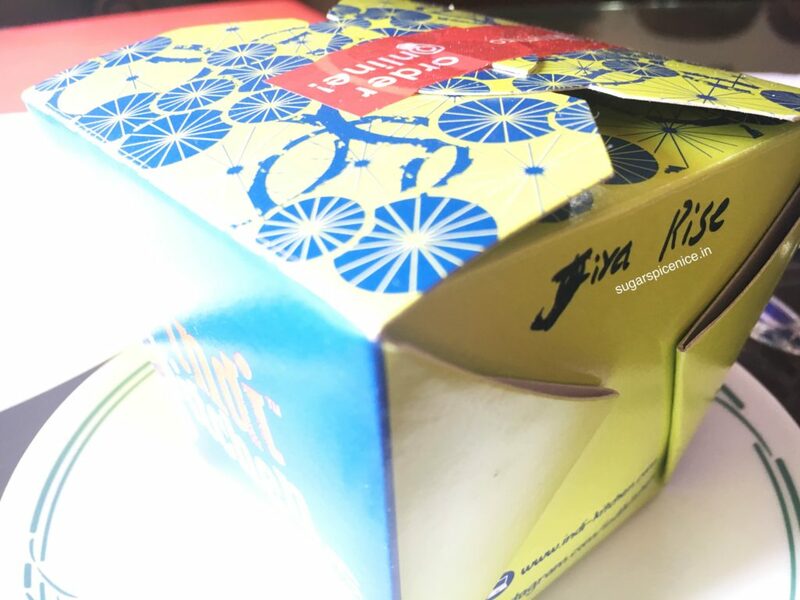 Them and vanilla ice cream together – double win! If just honey noodles weren’t good enough! 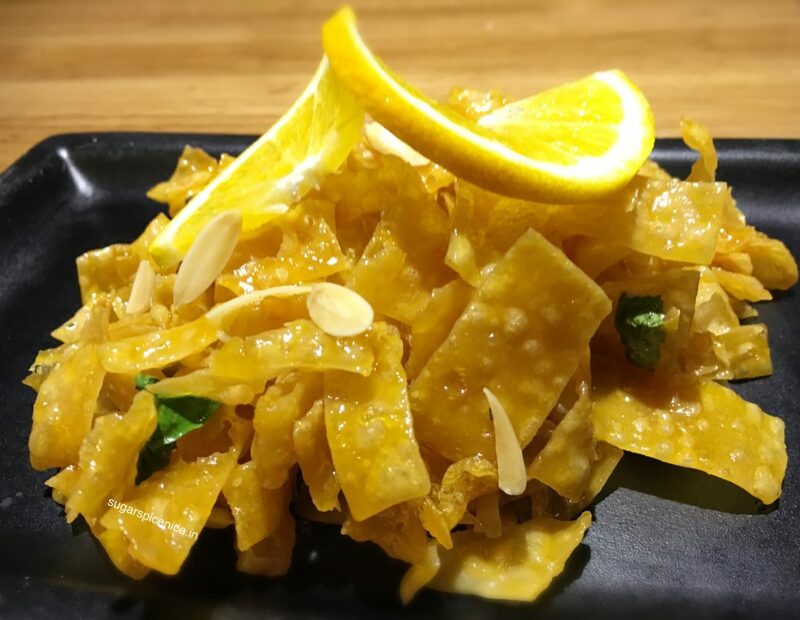 Zesty orange flavor on honey noodles make them even better. So sooooo delish. Another one in my list of favorite desserts. Hope you enjoyed watching and reading. 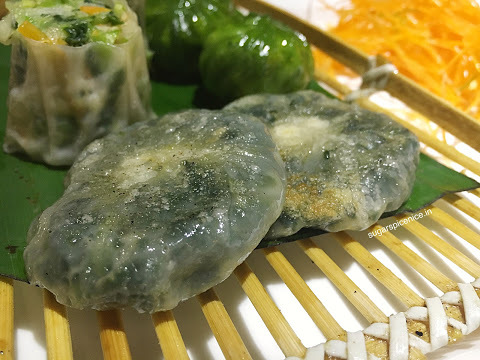 What is your favorite place for Asian food? Let me know in the comments below! 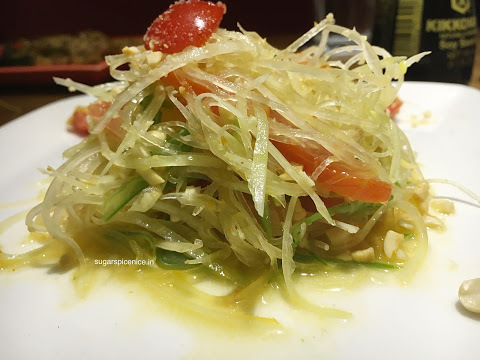 I am totally blown over by this place – every dish I tried, surpassed the previous one and the food was a different level of delish. Want to know what all I ate? 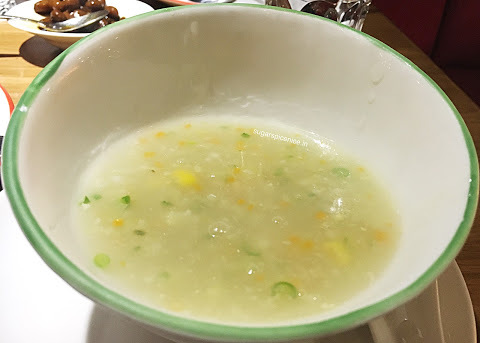 Keep reading my review of Asia Kitchen by Mainland China! 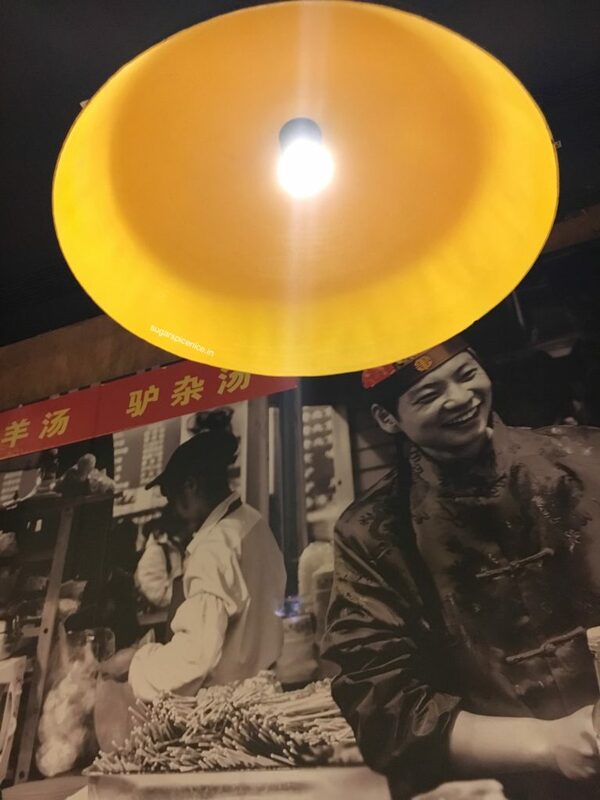 I recommend everything that I ate there! Because it was all so yummy! 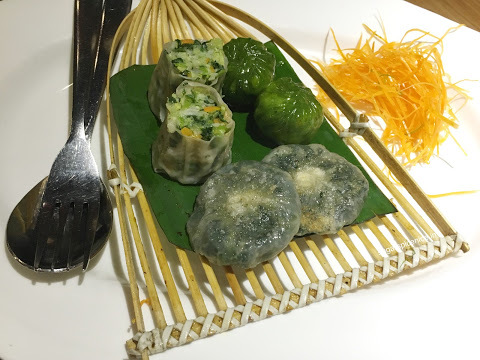 I remember going to mainland China in oberoi a while back and not enjoying the meal at all. From that to this – these guys have really upped their game. I will definitely come back! You should go too. 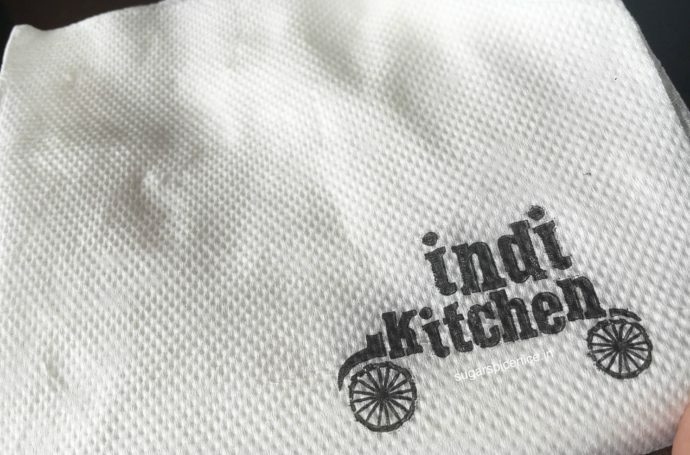 Indi kitchen delivers Indian food to your doorstep. 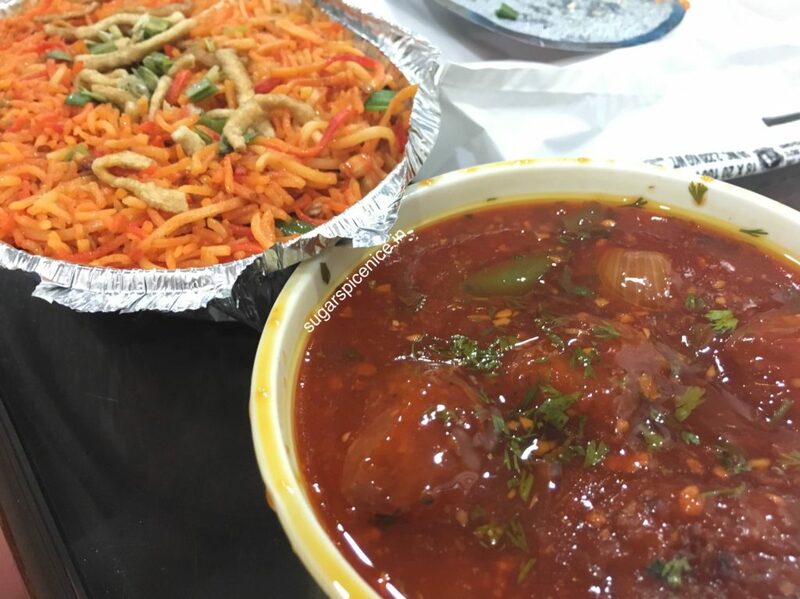 What’s good is that you can customize your meal as per whatever you feel like having – like you can choose between rice / rotis and the veggies you want and also the gravy that you would like. In that sense I think this is one of the first few doing it for Indian food..which is good. 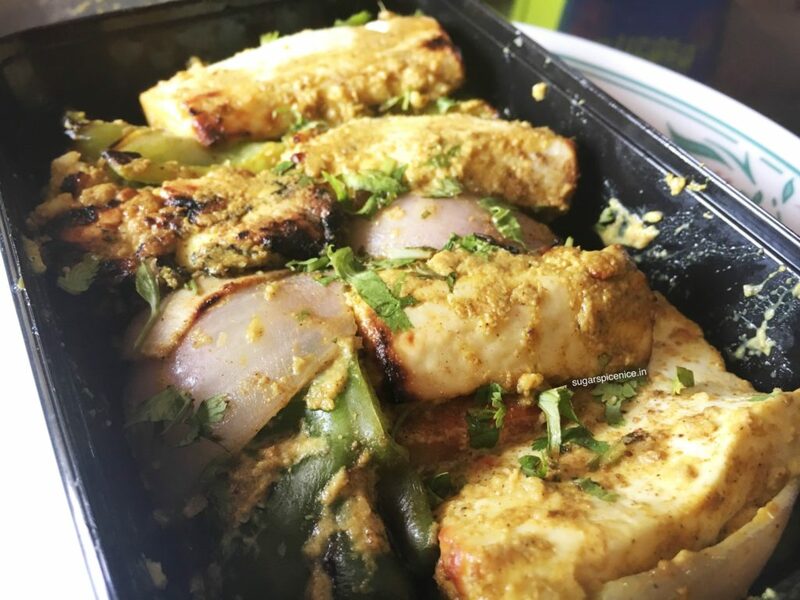 This is perfection – soft paneer chunks with onion and capsicum, marinated in a very tasty green coating. 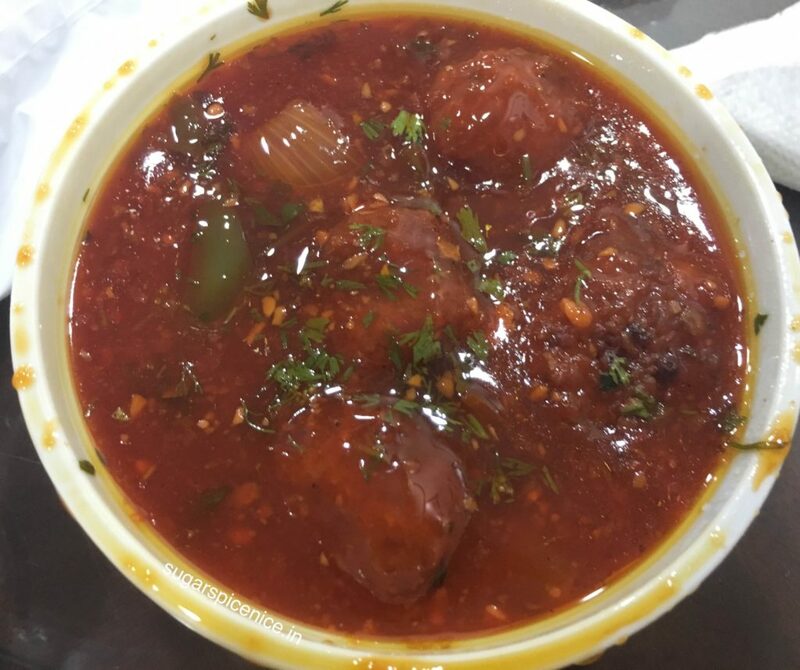 Excellent aloo filling – right amount of spices. I ate it slightly cold but couldn’t stop myself from hogging on this! 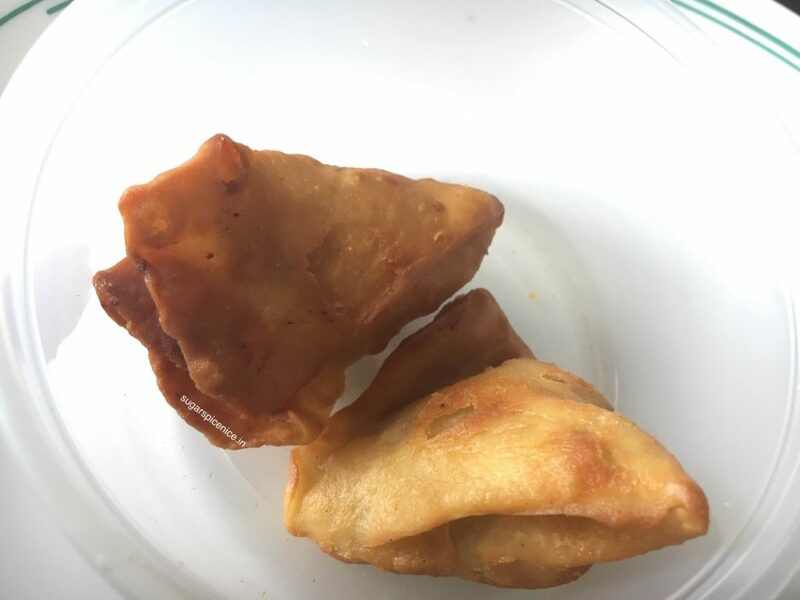 Mini samosas with a supremely generous amount of chocolate in between. 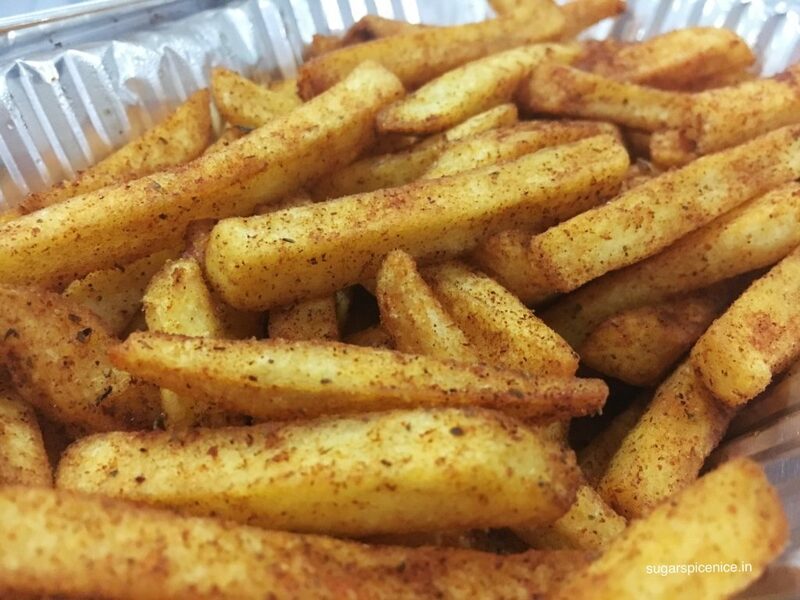 Eat these super hot. 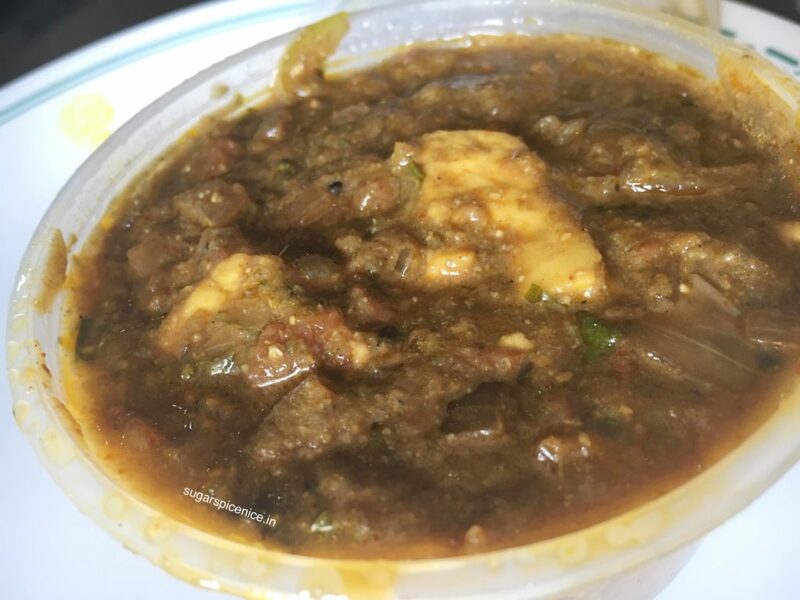 This one is actually quite tasty – you can just dip some naan in as a sauce / chutney and have it. 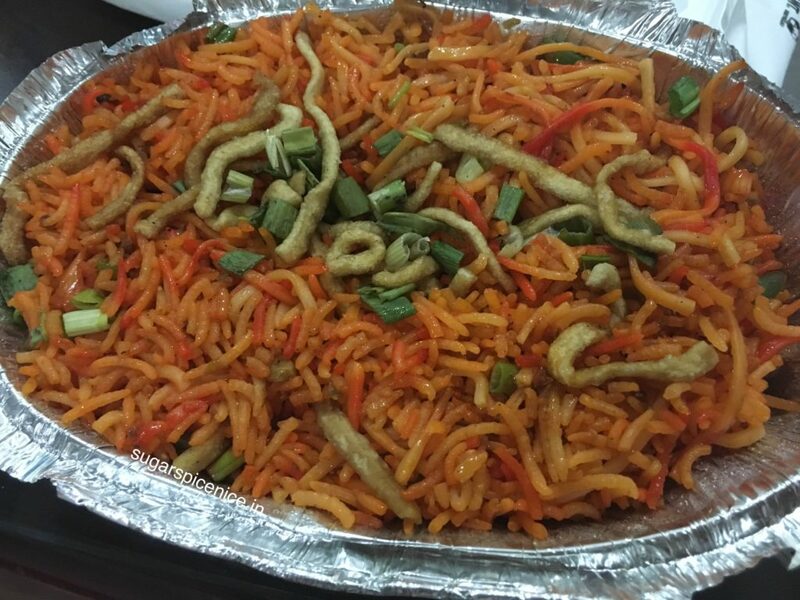 But only those who love spicy food can handle this. 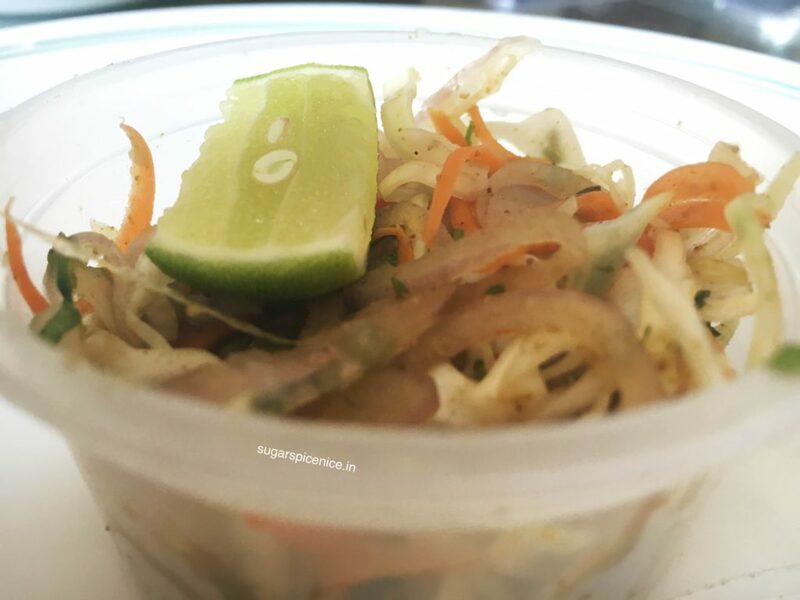 They also send a lovely Indian style salad – onion, carrot etc with lime and some spices. 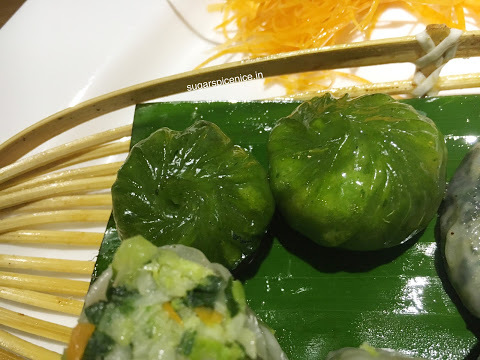 I also tried their methi mutter malai – it was alright..not overly sweet like a lot of other places. 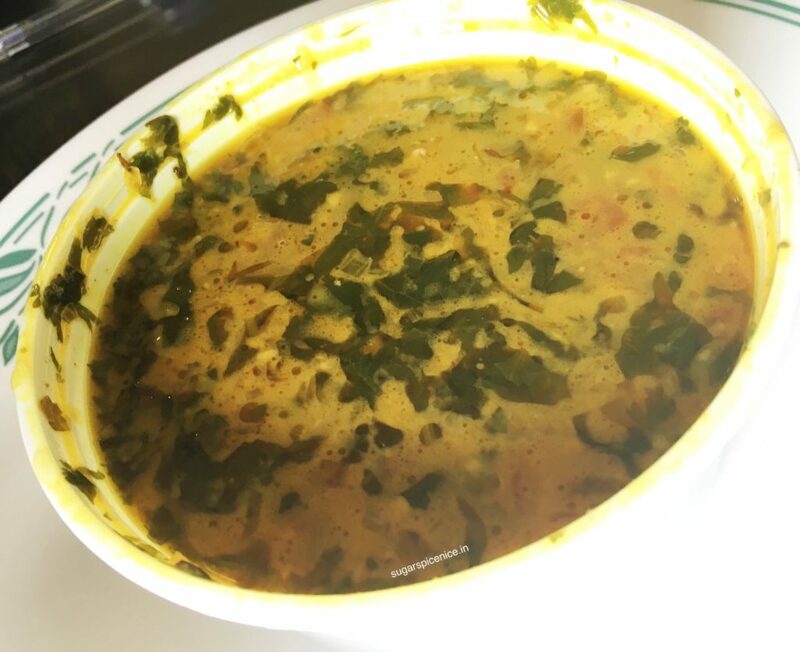 Then I tried their dal tadka as well and this one I didn’t particularly like. Try this out to your customized needs. You may like it. 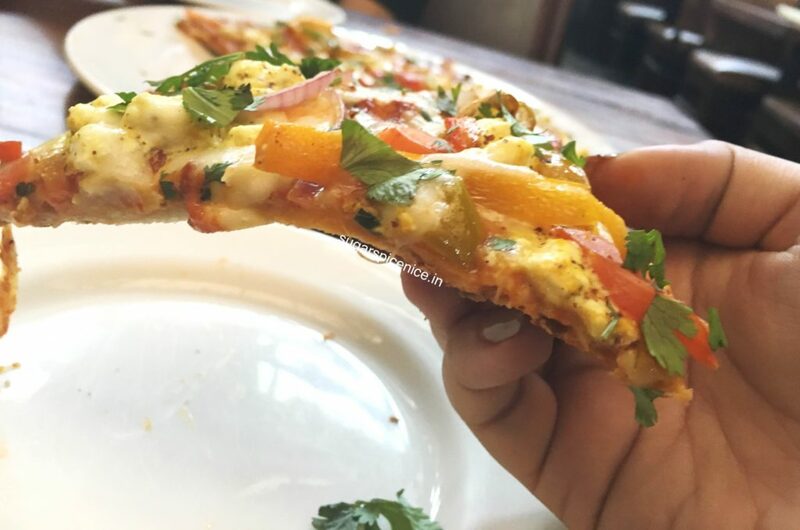 Some how California Pizza Kitchen doesn’t do it for me. Been here multiple times and have had that meh feeling on all those times. 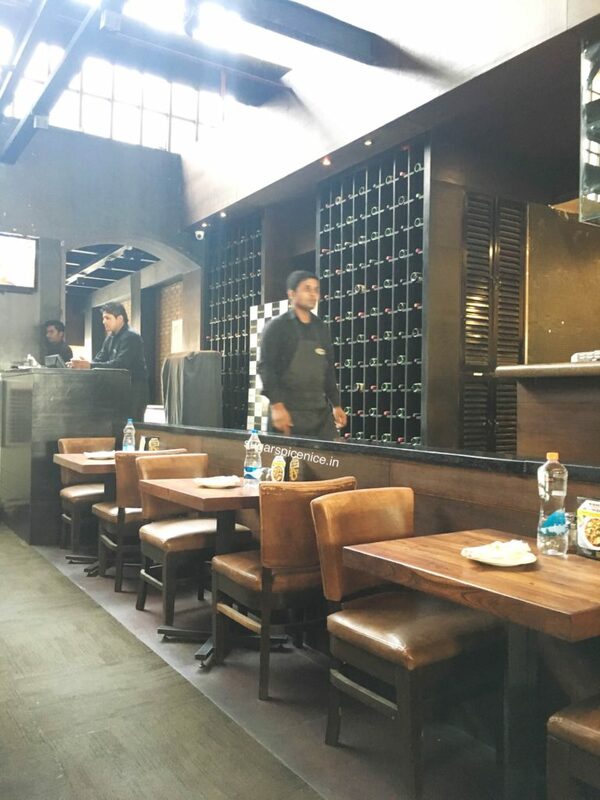 Jumping into what I ate – I opted for their set meal lunch menu which was for around 700 bucks and had a non alcoholic beverage, a starter, a pizza or a pasta and a dessert. Best part about this was that I could share it with another person. 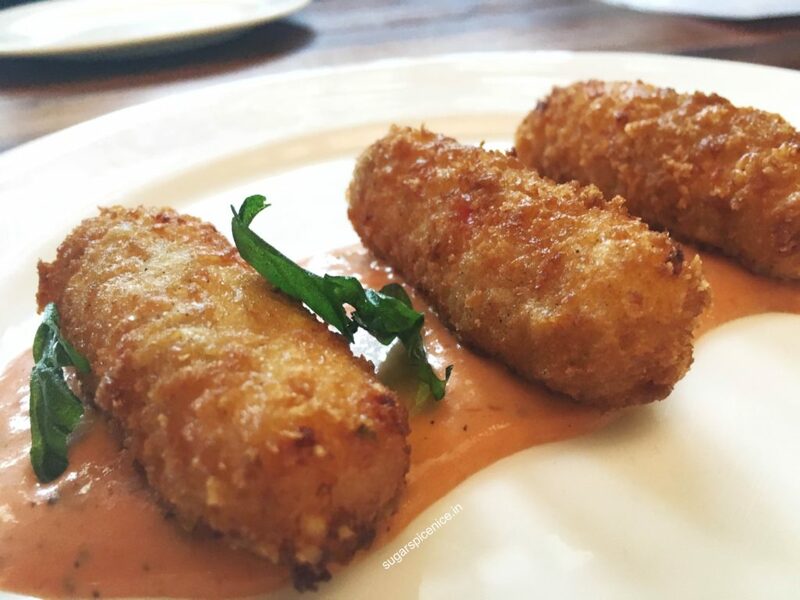 For starter, I tried their fried Mac and cheese. 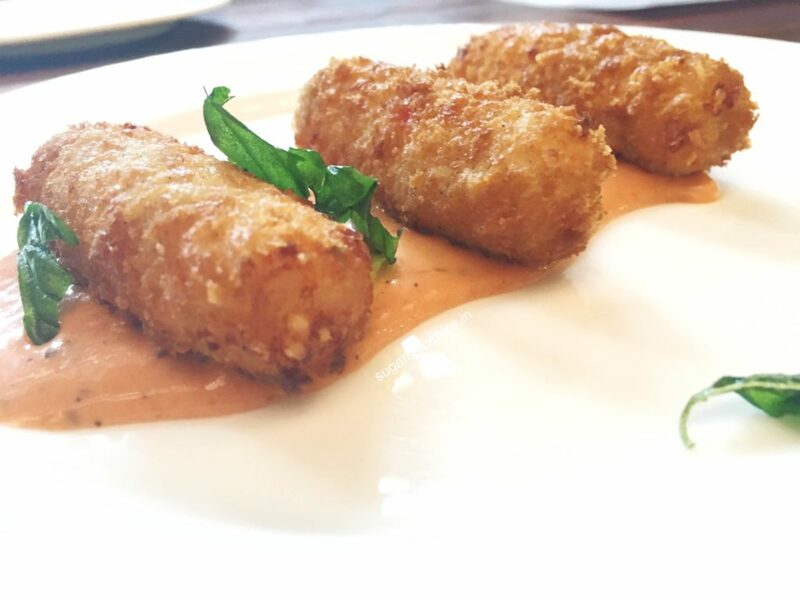 This was as the name suggests, Mac and cheese in a crispy outer covering. First time trying this out and it was pretty decent. 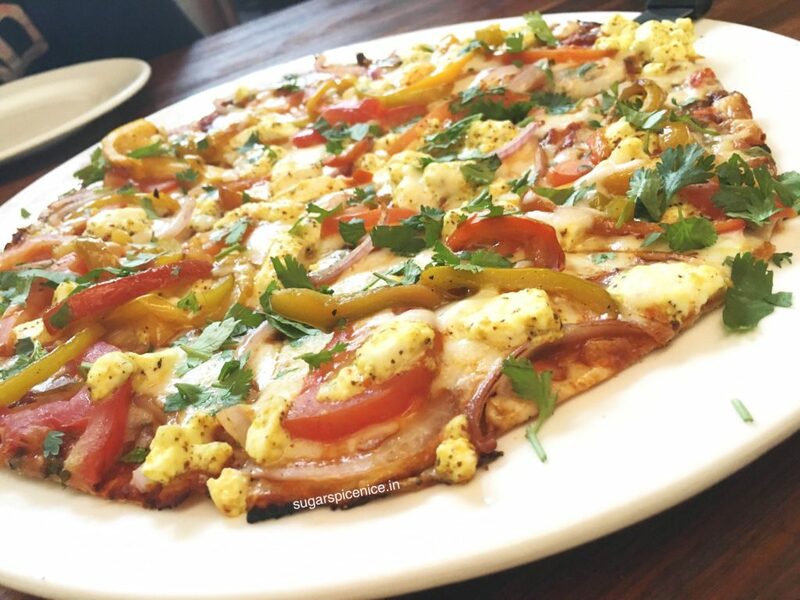 I opted for their pizza and tried the thin crust kasundi paneer pizza. 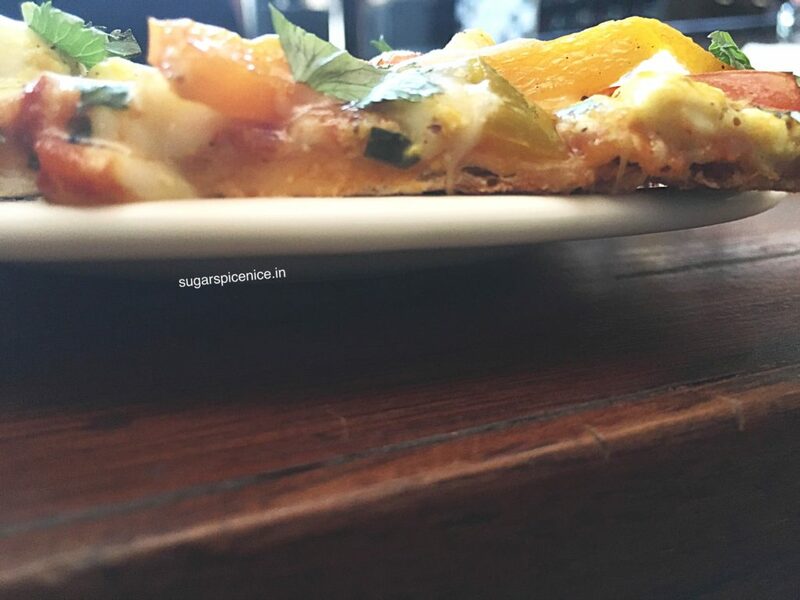 This thin crust almost felt like skinny crust – uber thin for my liking. 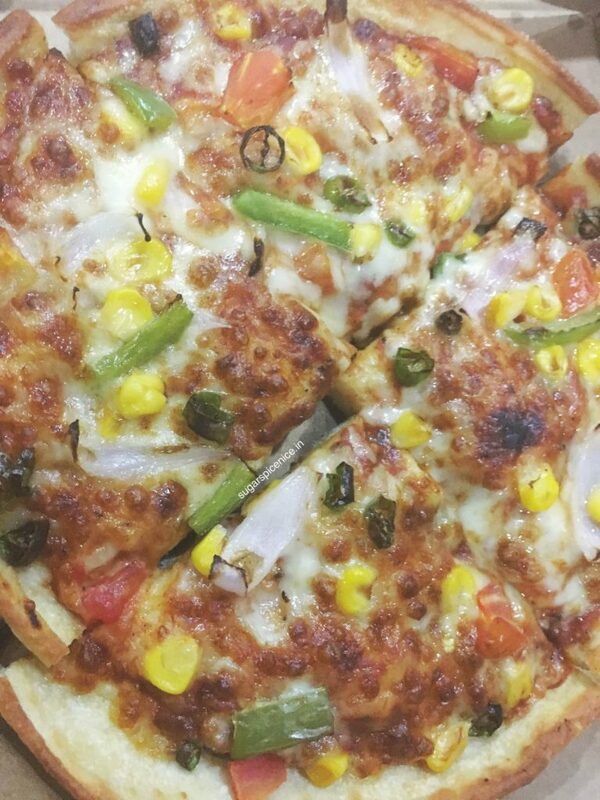 And the pizza was covered end to end with paneer, tomatoes, peppers and lots of other veggies in an Indian sauce. 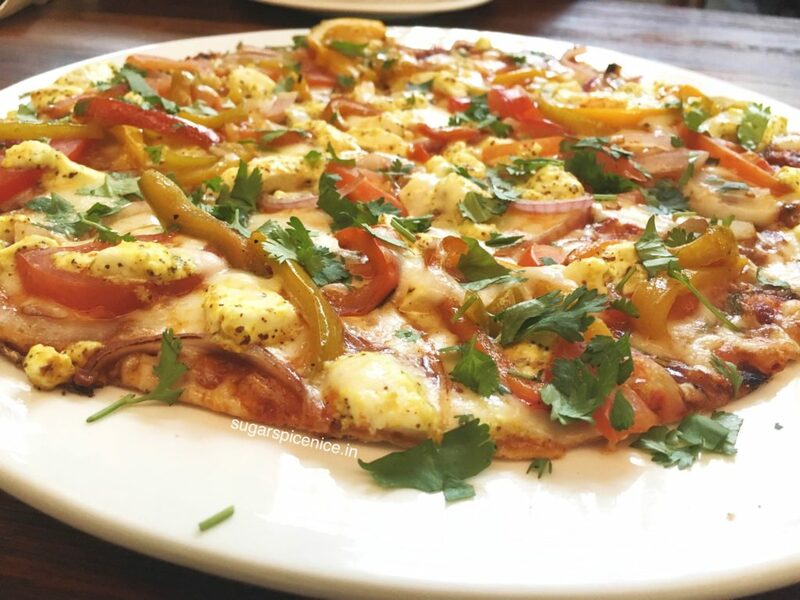 The taste wasn’t all that great – I mean an Indian pizza needs to be all kinds of tasty and chatpata but this one lacked that zing. 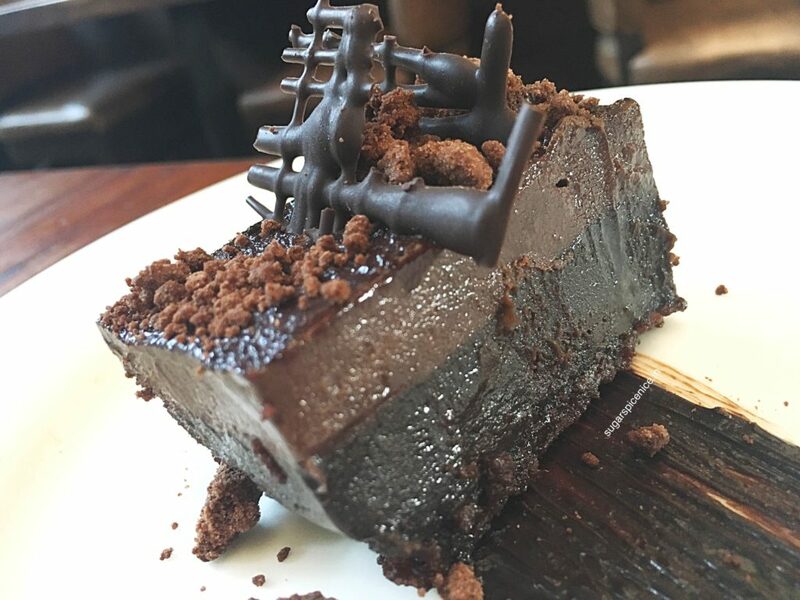 For dessert I had their chocolate trinity – and it was super! 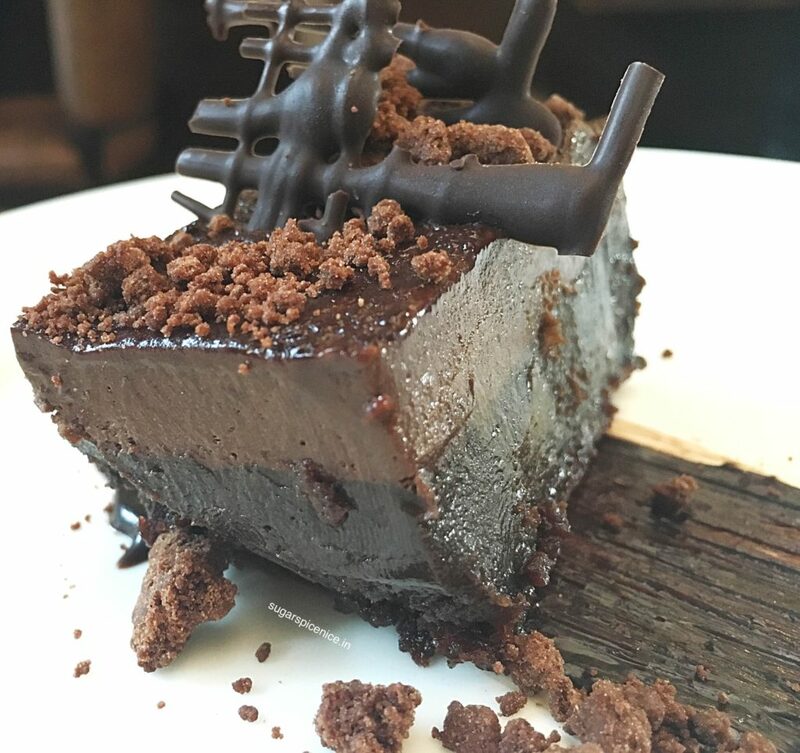 Loads of dark chocolate and chocolate mousse together..it was dense and really heavy duty. Only glitch was the cocoa powder on top seemed a bit too flaky. Otherwise this is top notch! I also had their ice tea and that was alright. 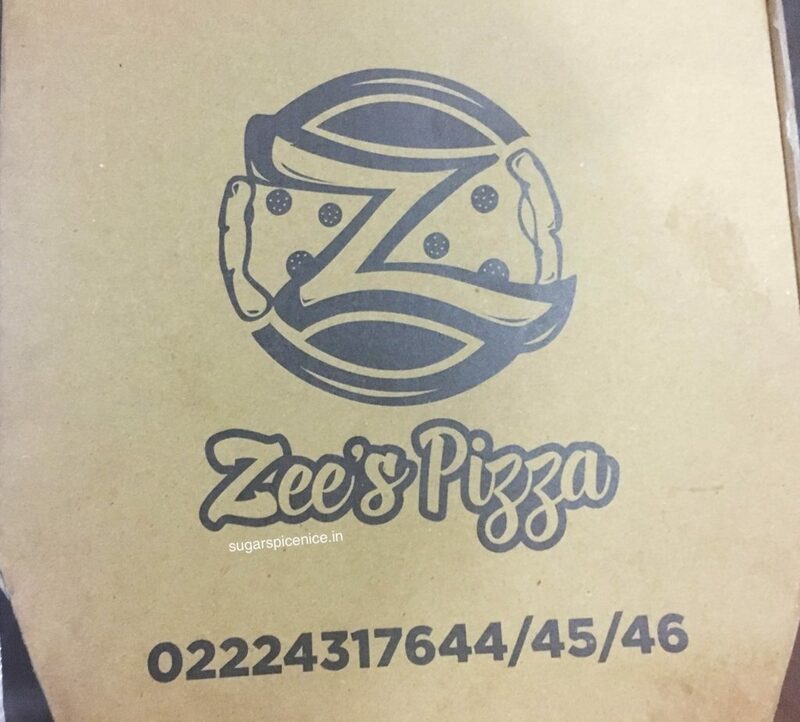 I recently ordered from Zees Pizza after seeing it on Zomato. This was traditional call and deliver and not via app. 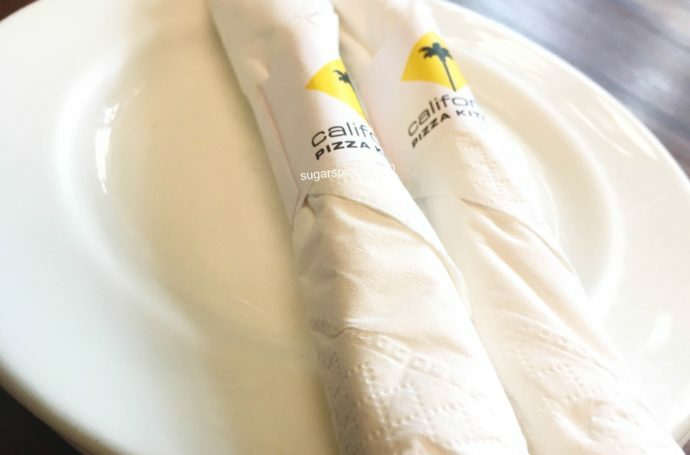 I tried their vegetarian pan pizza and the vegetarian calzone. 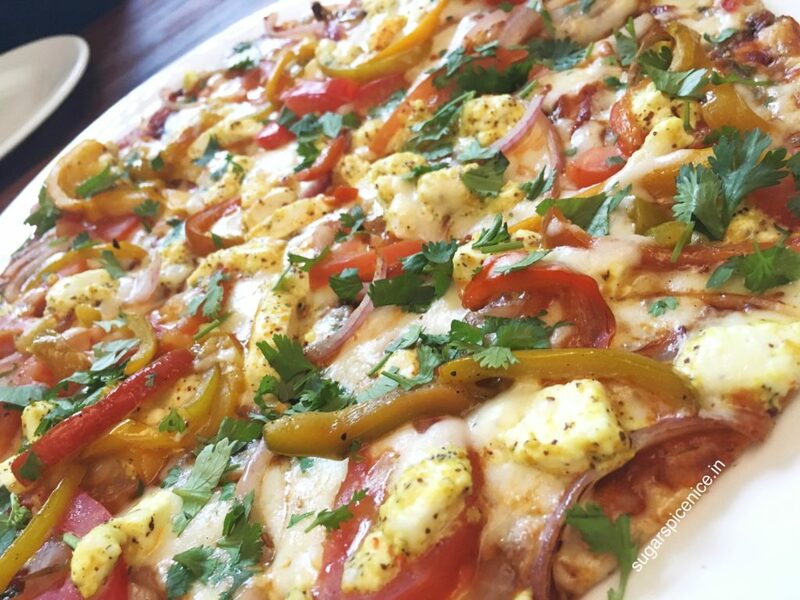 The pizza is exceptional – 5 veggie toppings for 99 bucks! And you have an opinion of either marinara or tandoori sauce. The pizza doesn’t feel like an effort to chew, sauce is super tasty. 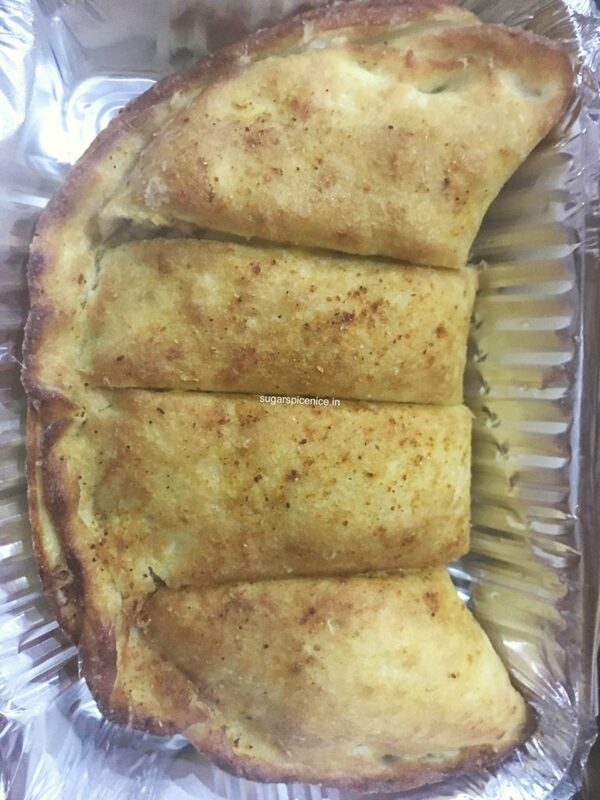 Coming to the calzone – AweFreakinSome! I’m not exaggerating here at all. 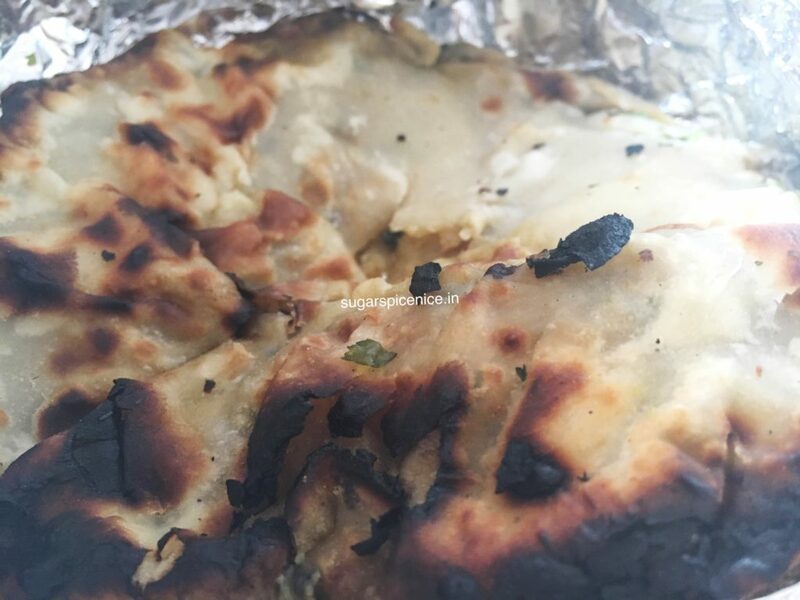 Yummy paneer filling in a mayo kinda sauce and probably some other things too. Very very good. I’m not too fond of calzone but this was super. And was actually recommended to me by the person taking my order! Recommend this place 🙂 I can’t wait to try more of their stuff! 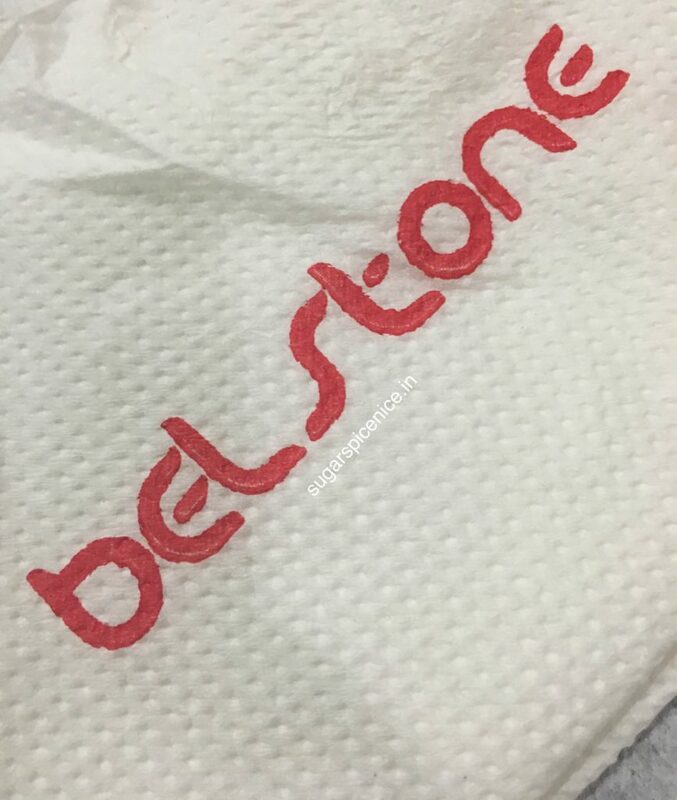 I recently ordered from Belstone via Zomato delivery. 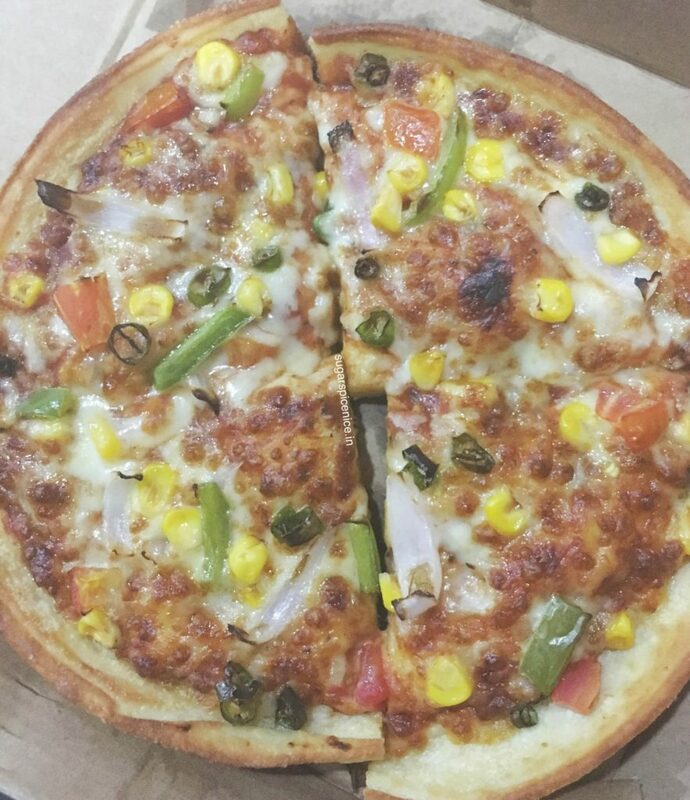 I was craving Veg Triple and saw the email guys delivering so I decided to give it a go. 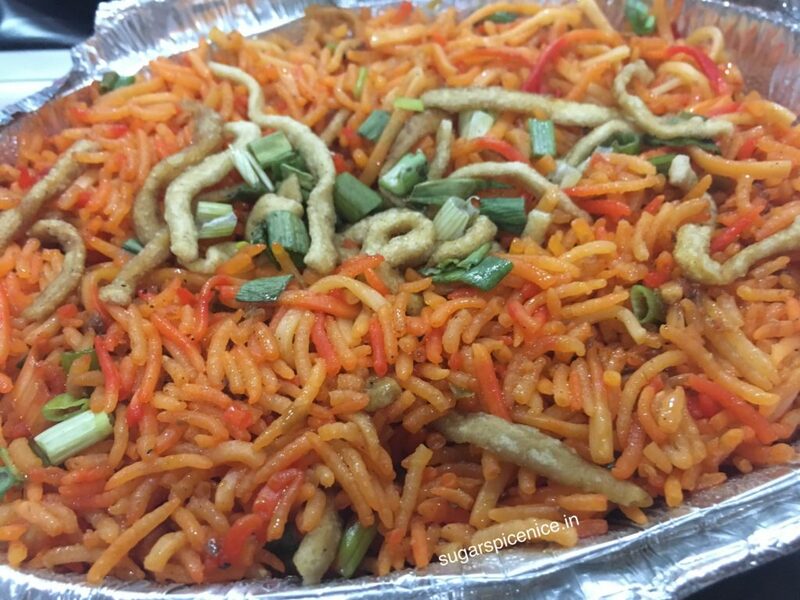 This is probably the most colored veg triple i have seen – the rice was all kinds of orange..ranging from dull to bright. It didn’t even taste that good! The gravy was pathetic – crazy crazy spicy (i mentioned less spicy) and so much color in that too. The fried noodles that were barely there were soggy and how! Don’t recommend this place at all.